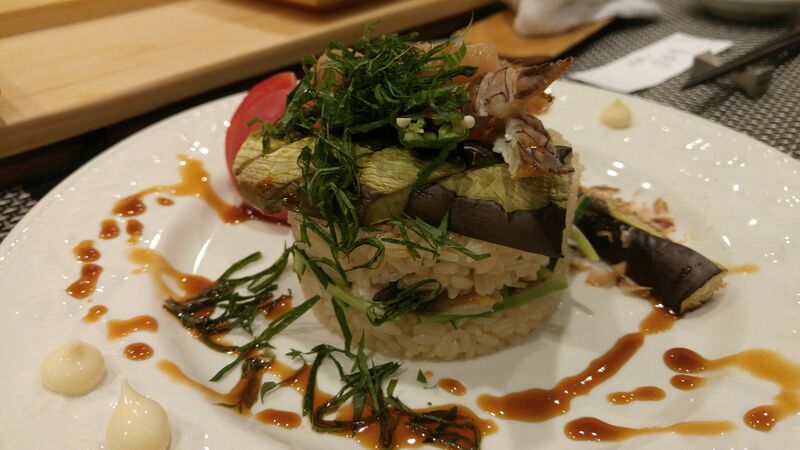 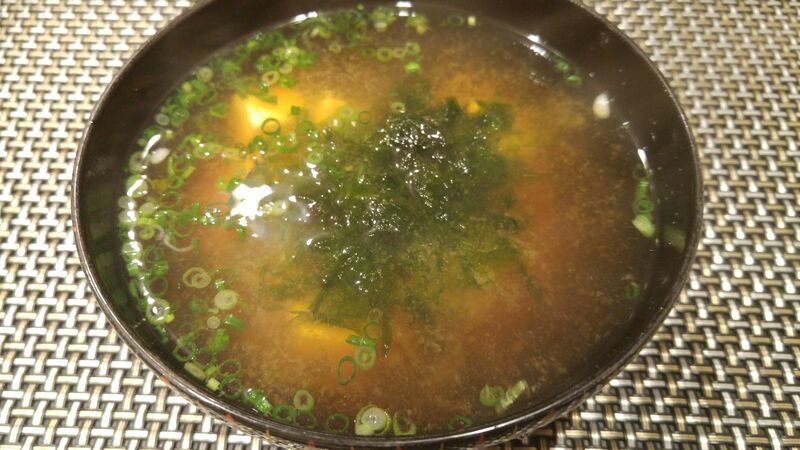 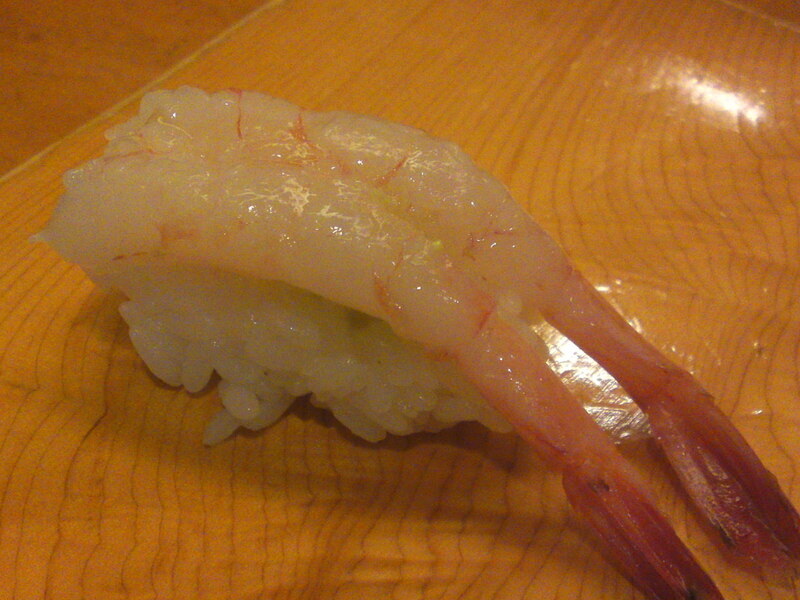 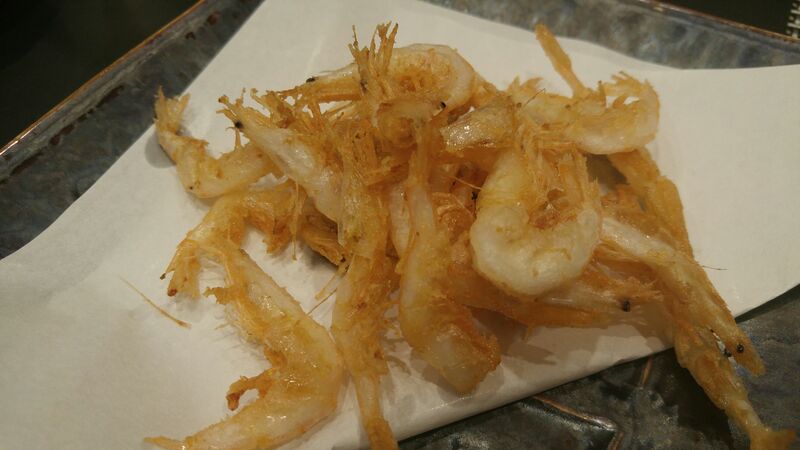 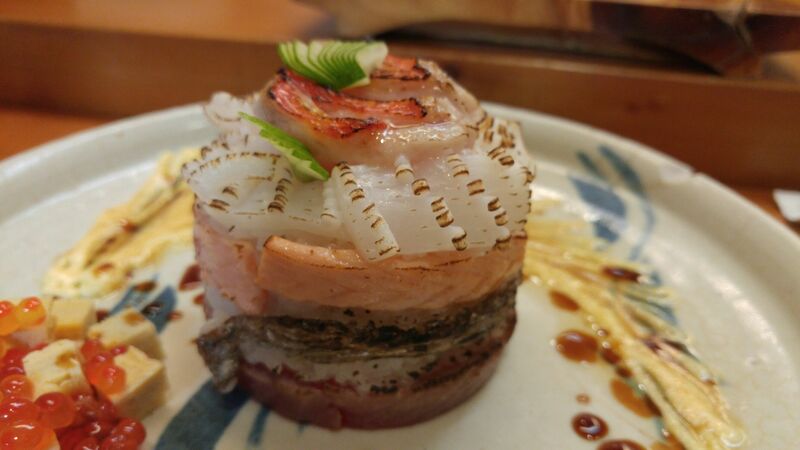 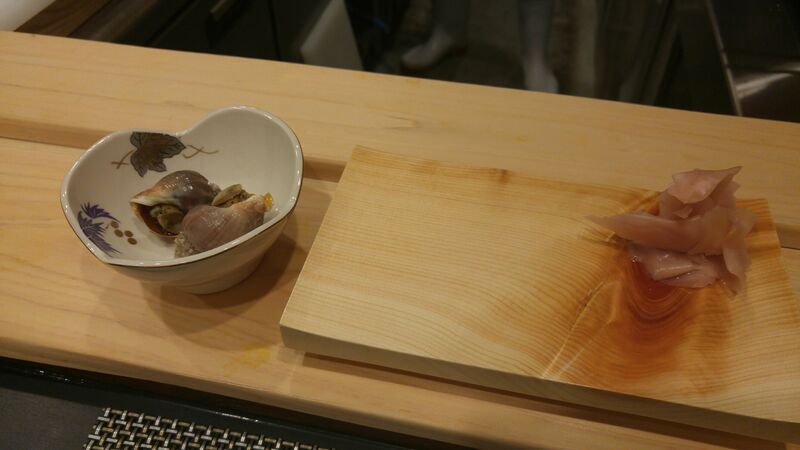 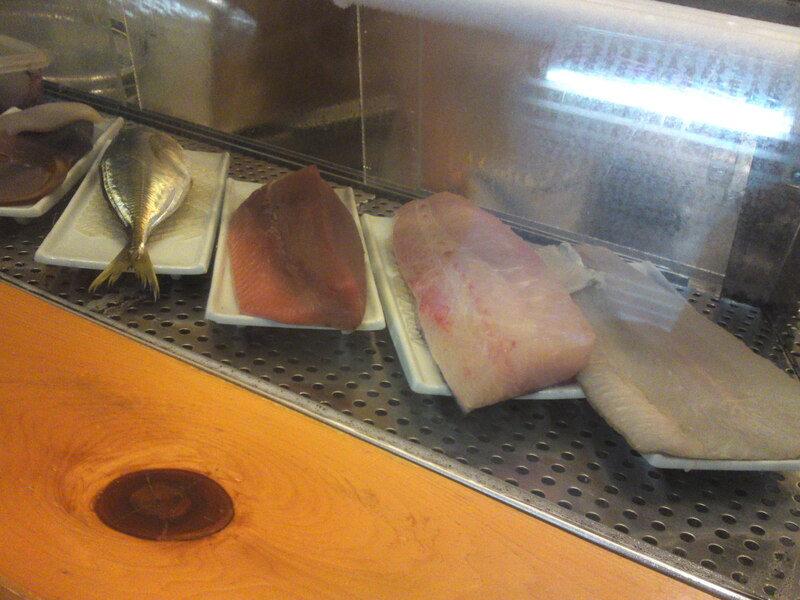 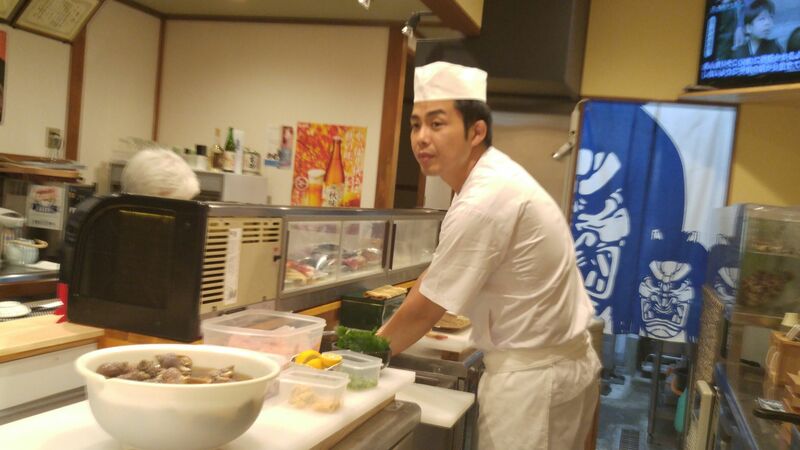 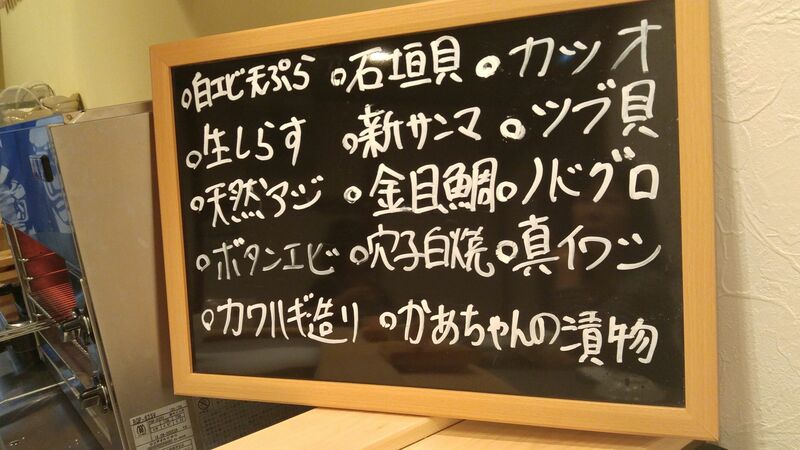 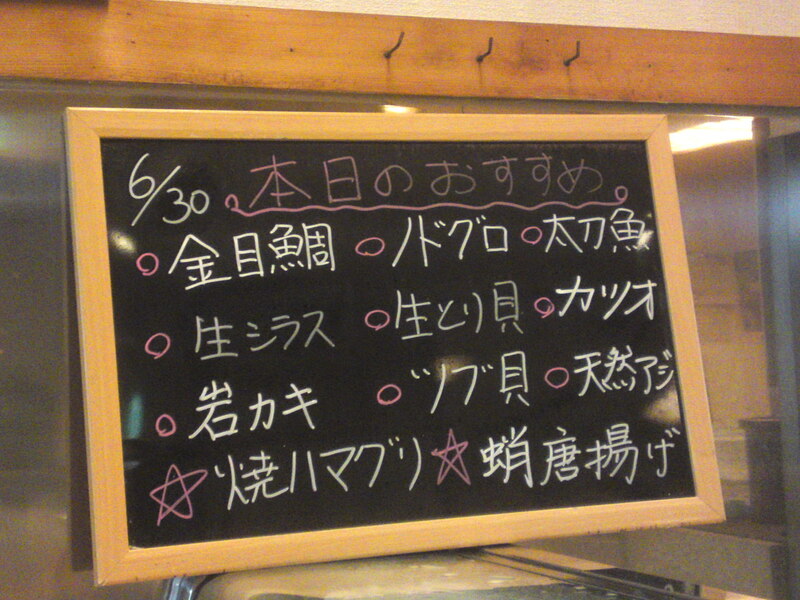 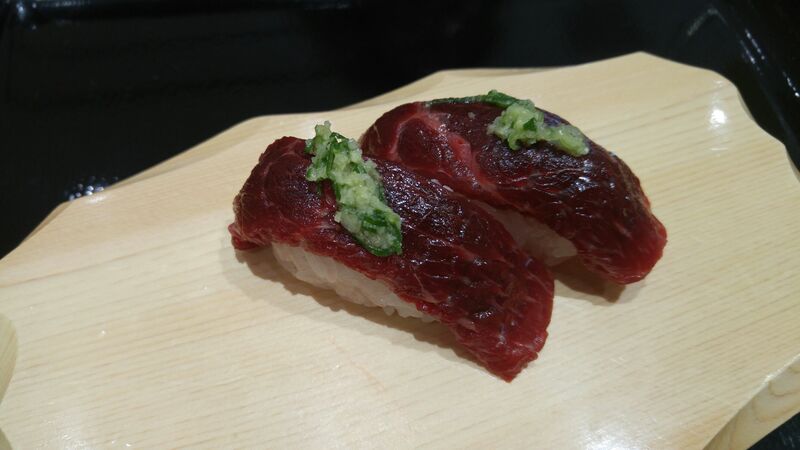 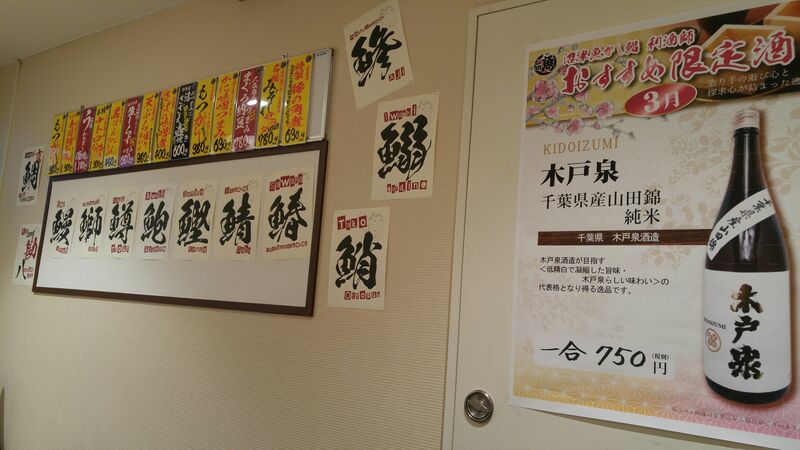 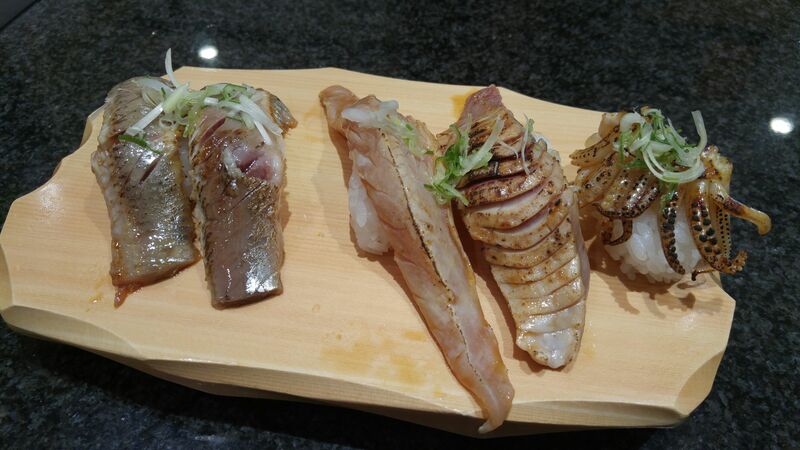 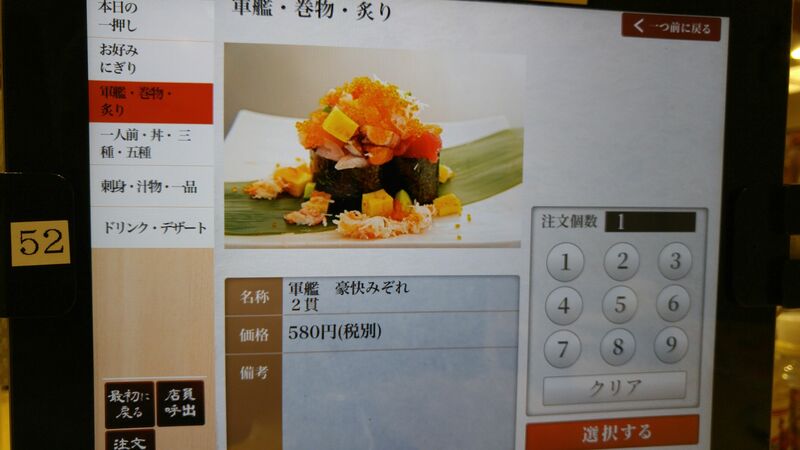 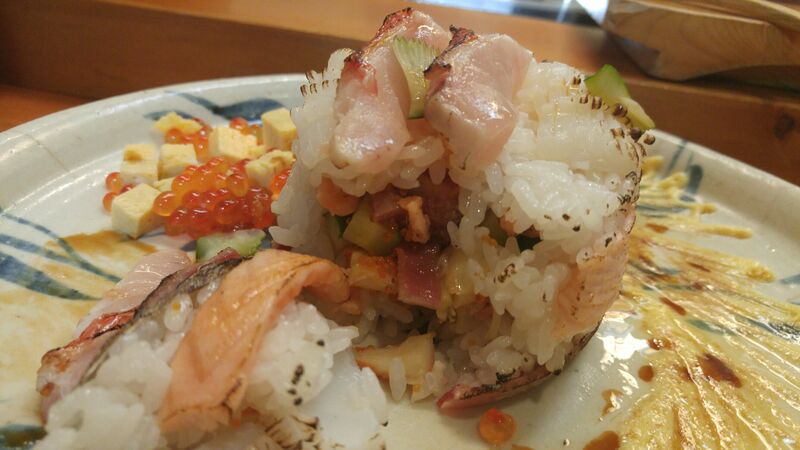 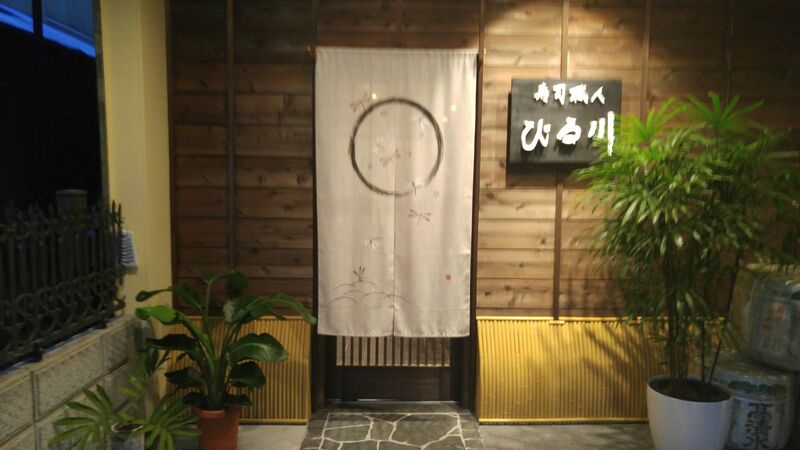 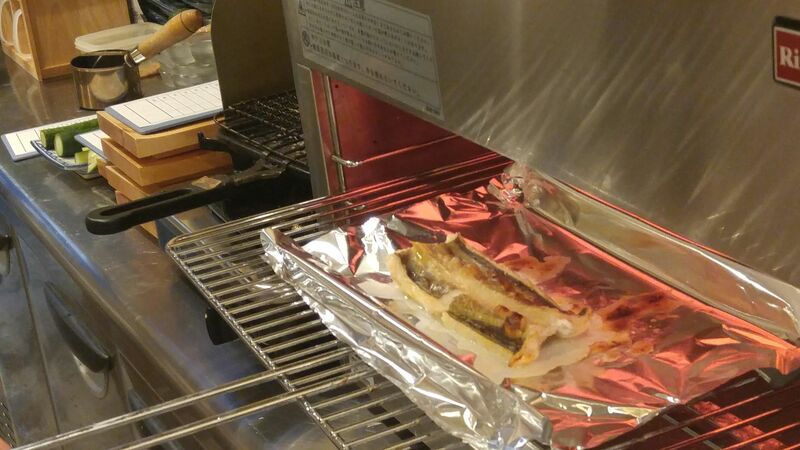 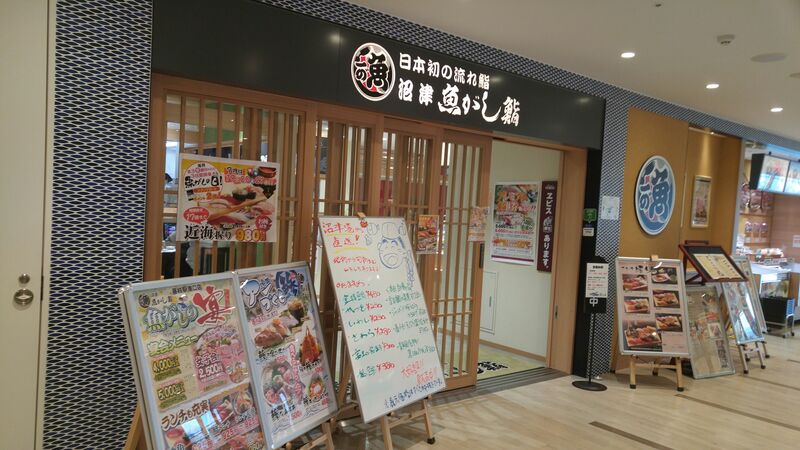 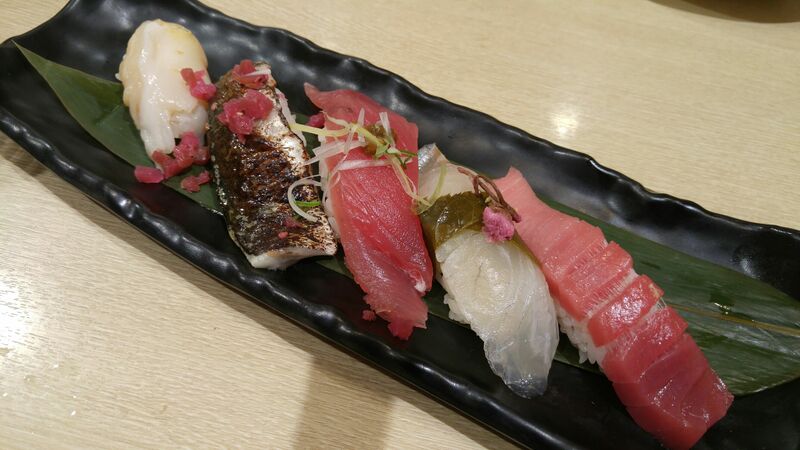 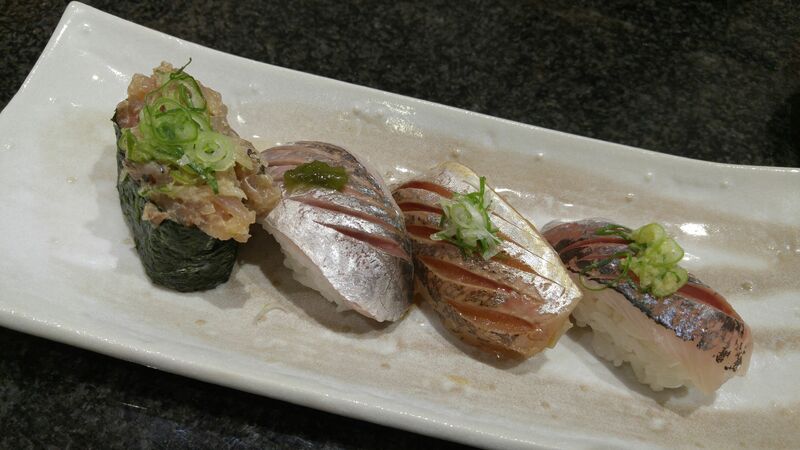 Sushi Restaurant: Dinner At Sushi Ko (June 2015) In Shizuoka City! 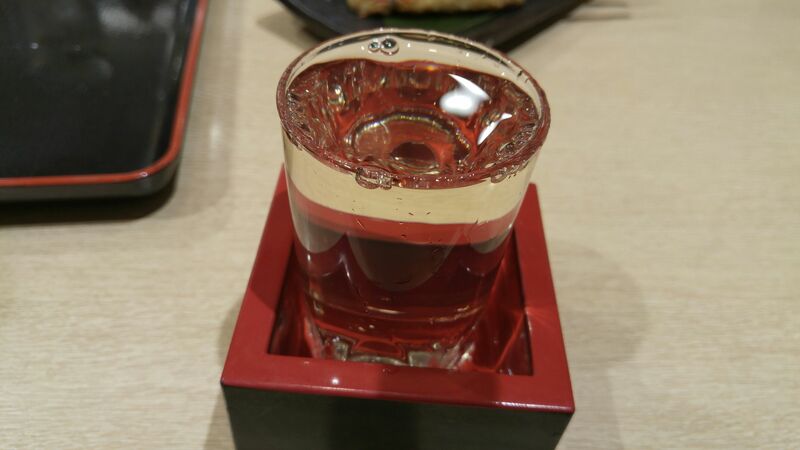 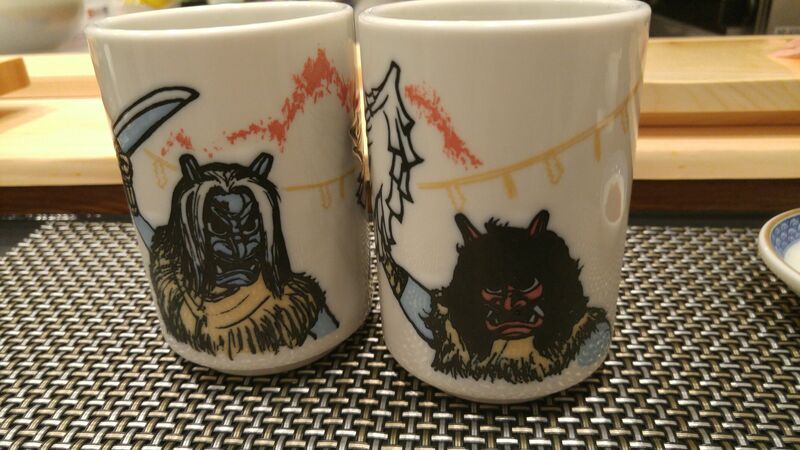 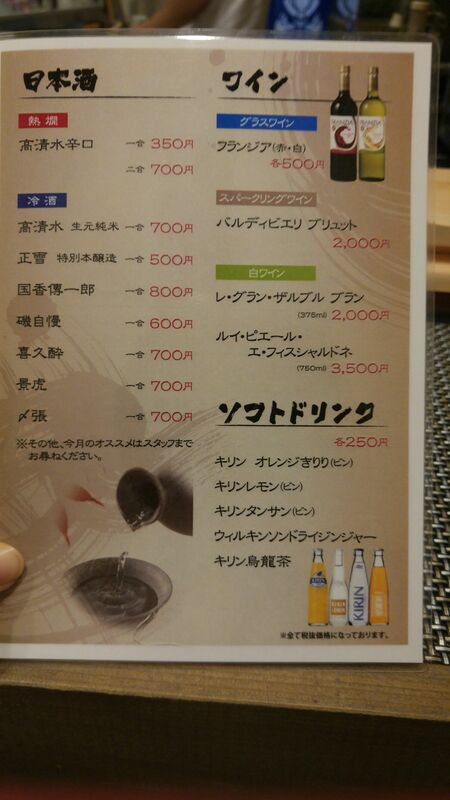 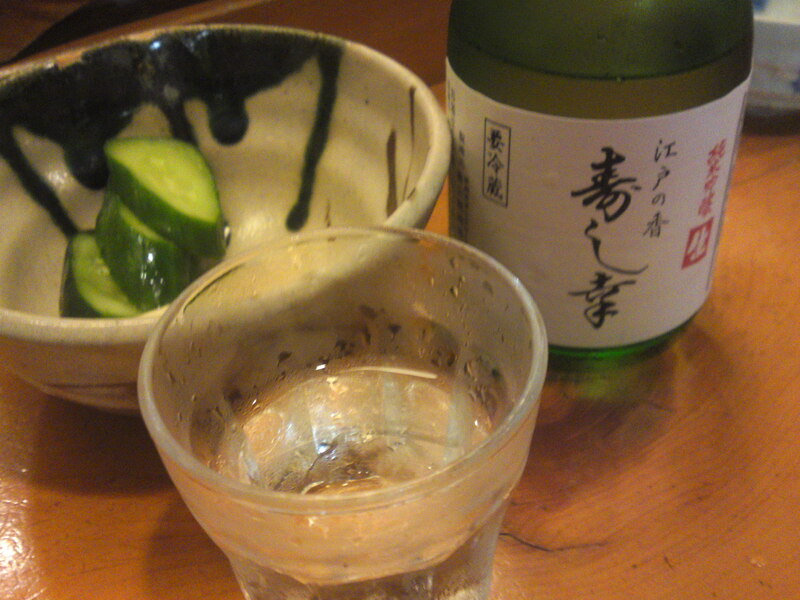 O-Toshi/お通し, the snack coming with the first drink. 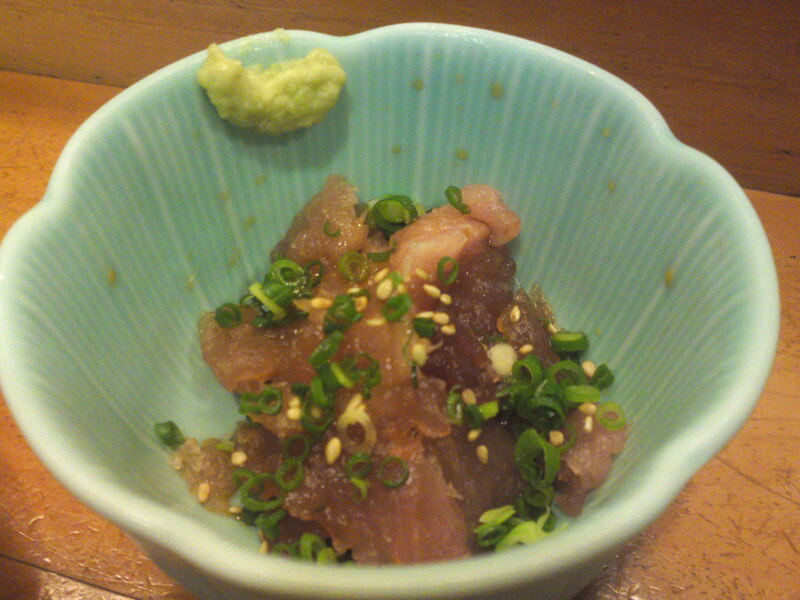 Tuna tartare/maguro tataki/鮪叩き! 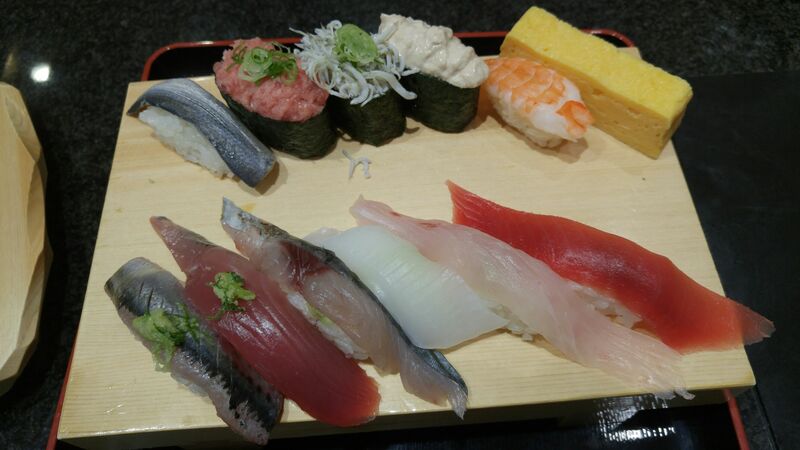 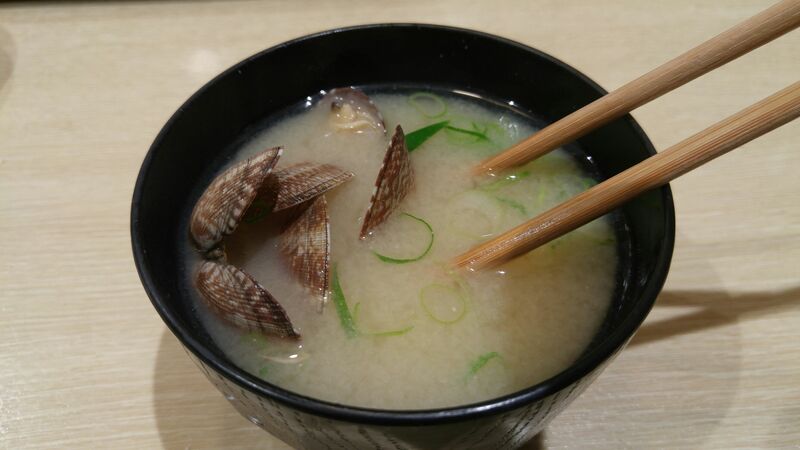 The variety of seafood is unequaled in the City thanks to very very strong links with fishermen and fish markets all over Japan. 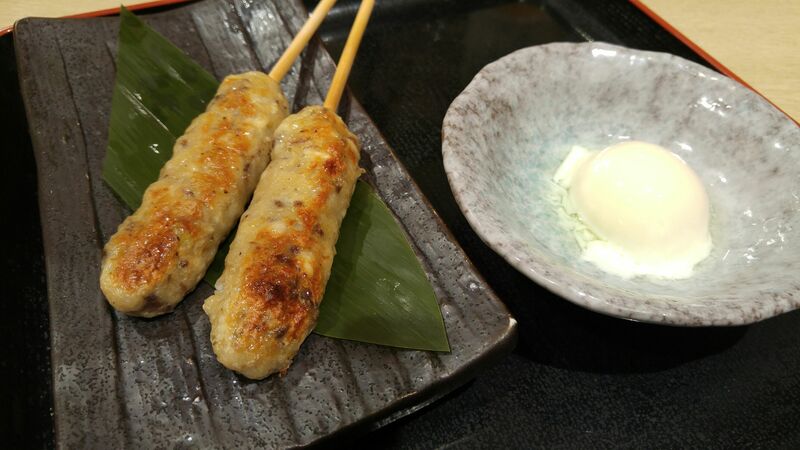 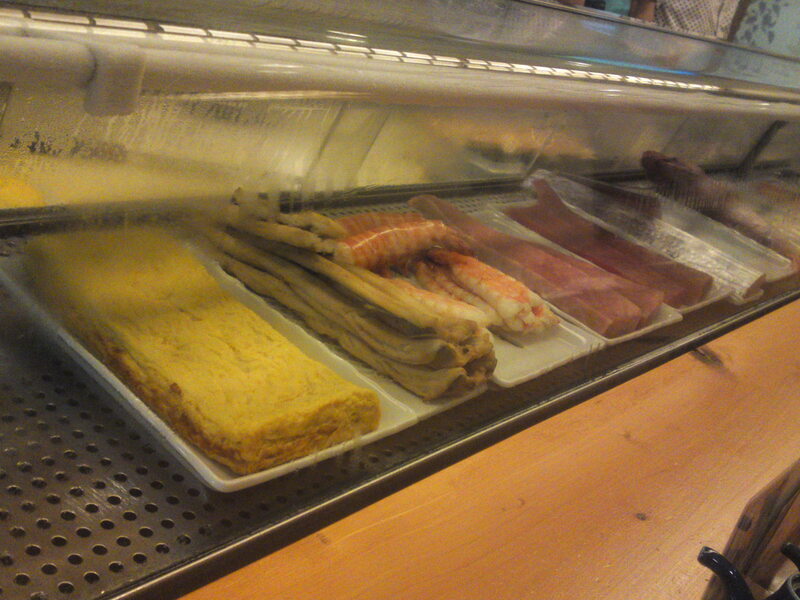 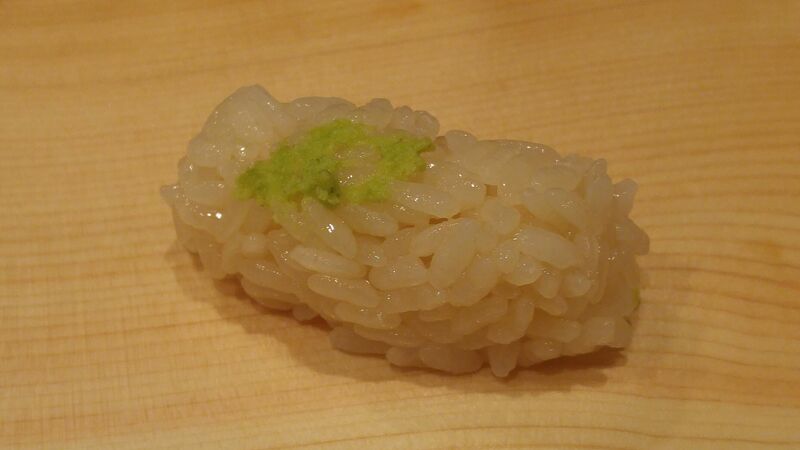 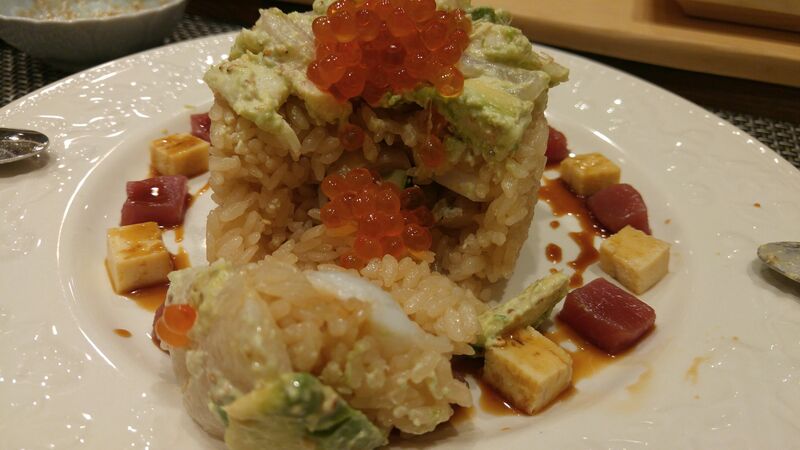 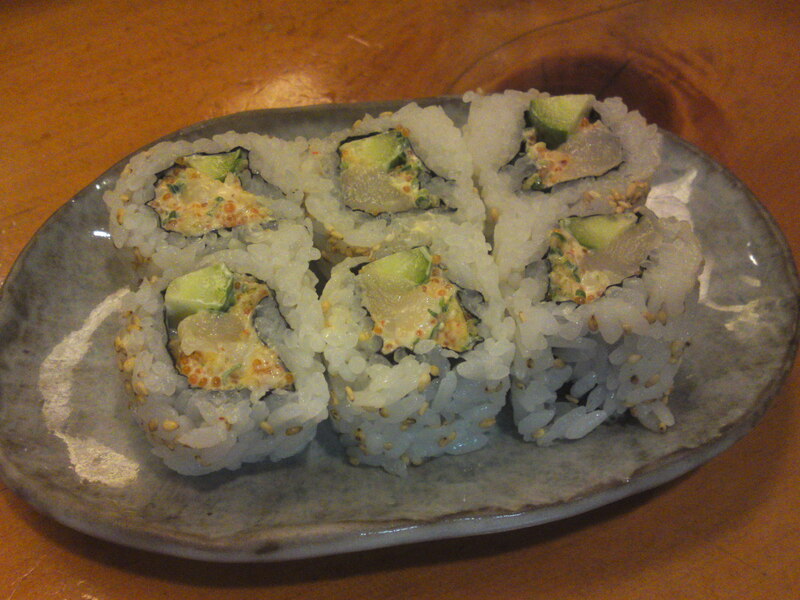 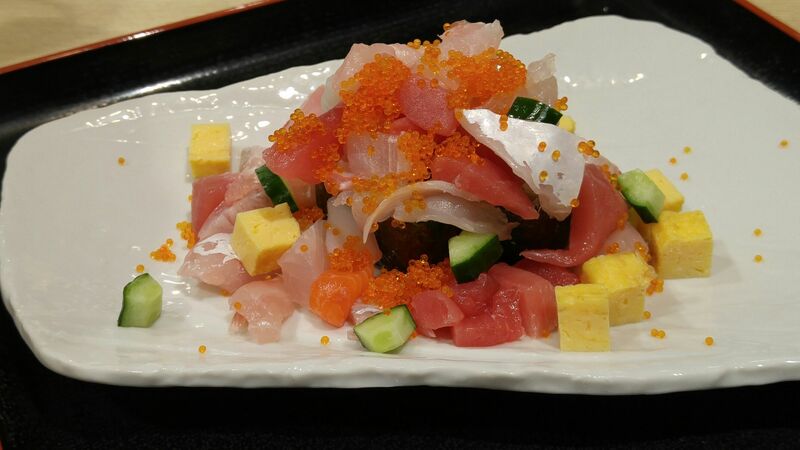 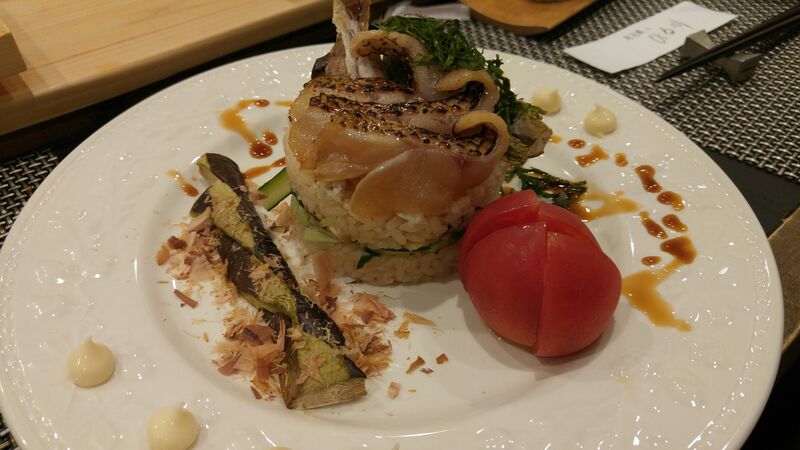 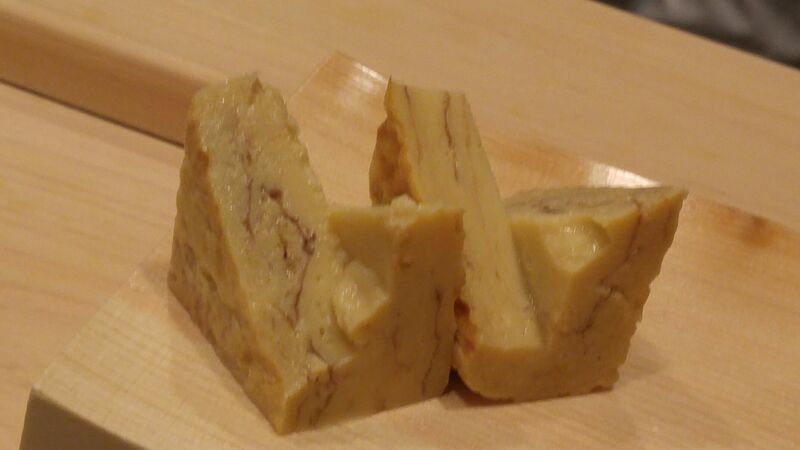 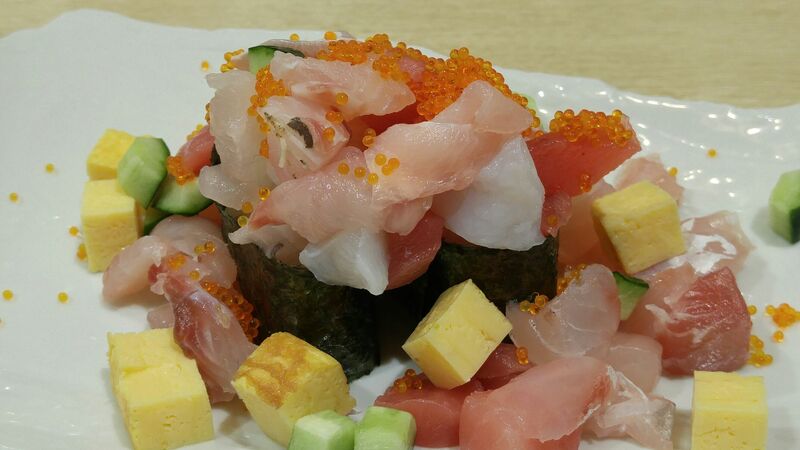 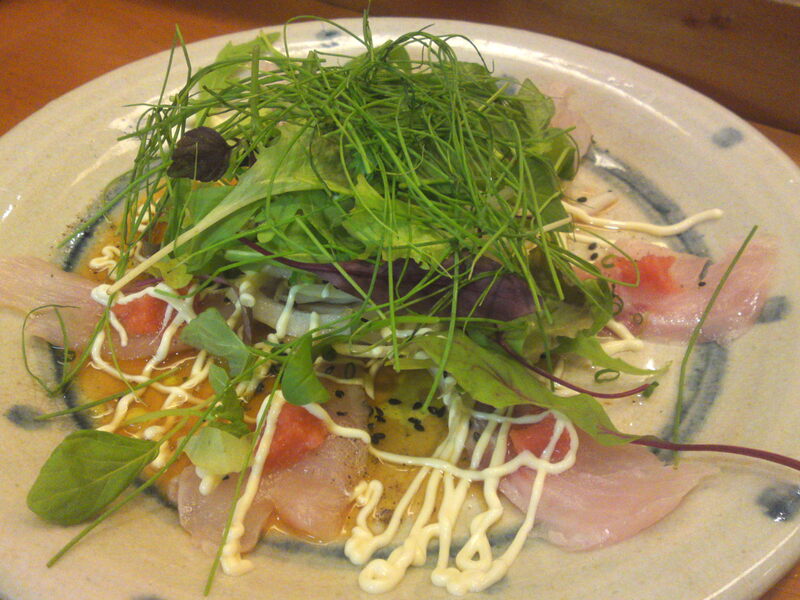 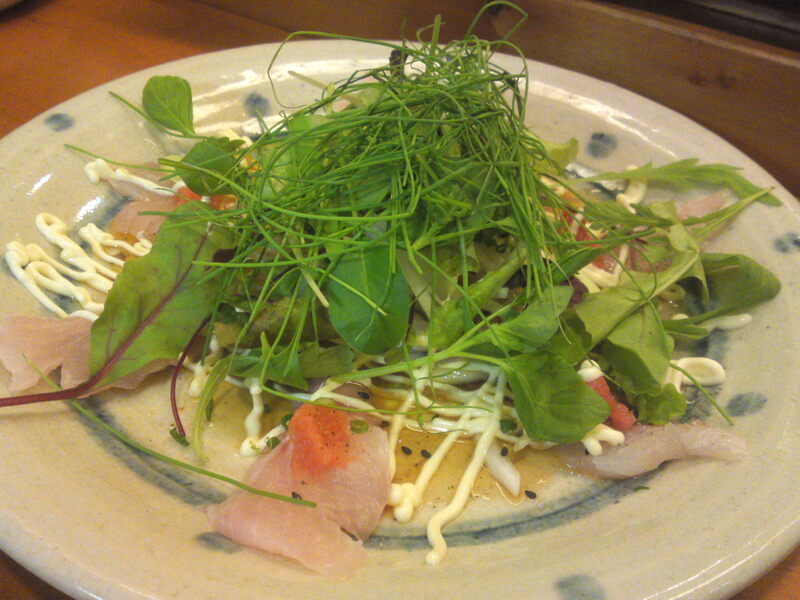 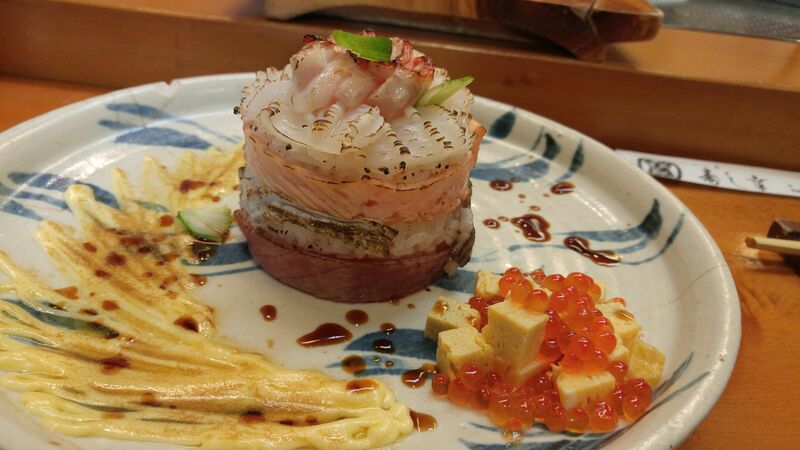 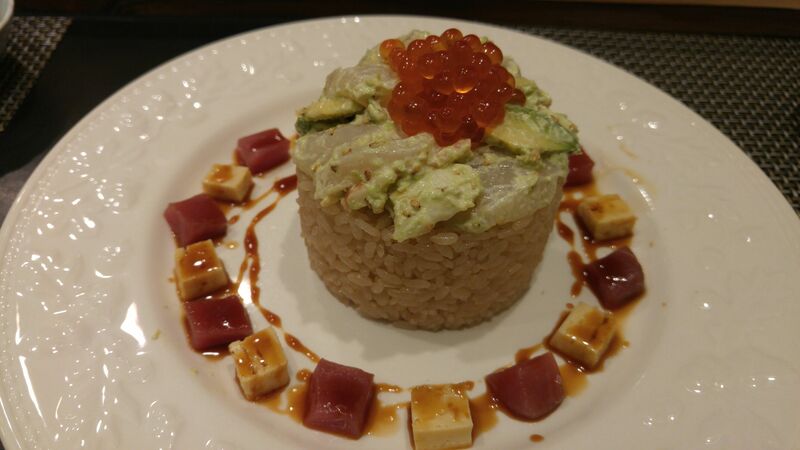 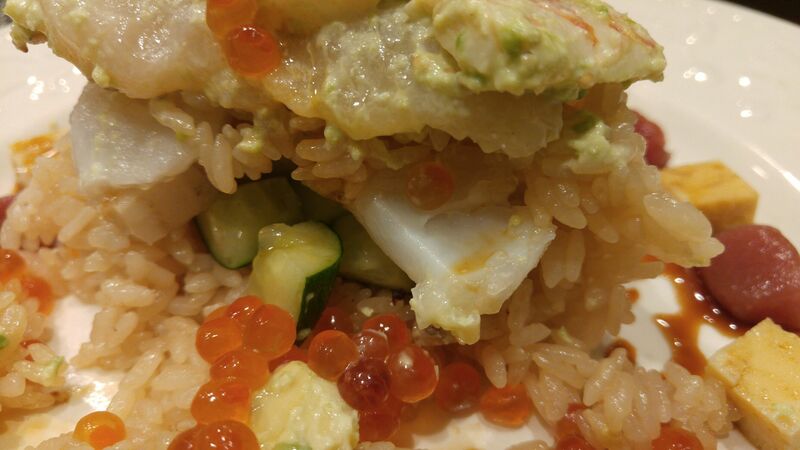 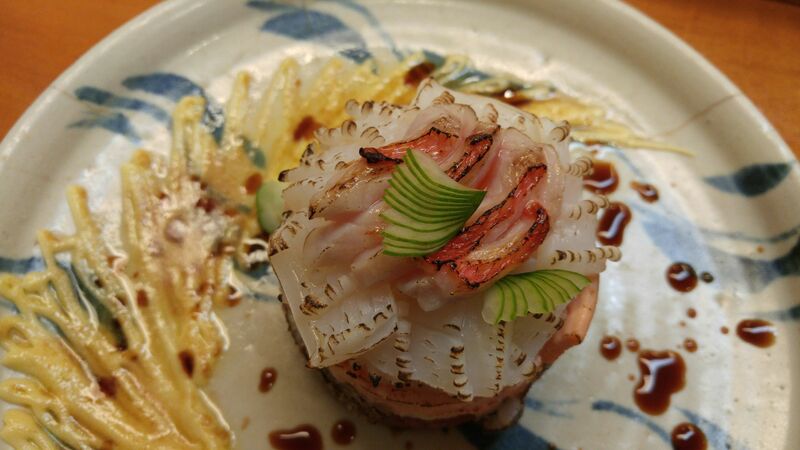 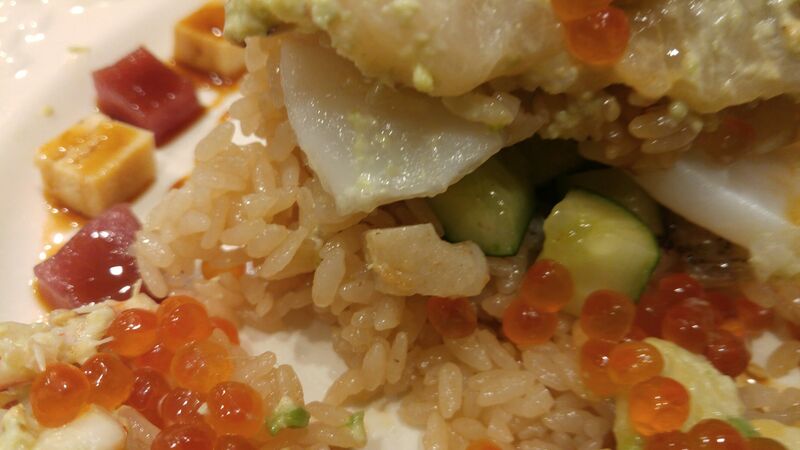 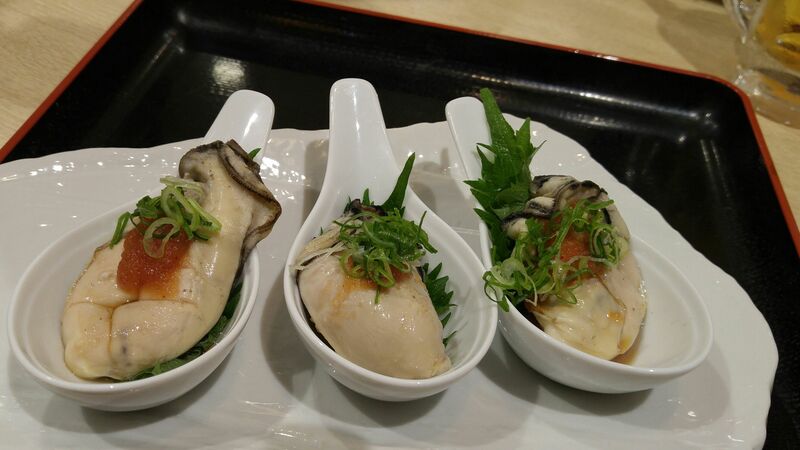 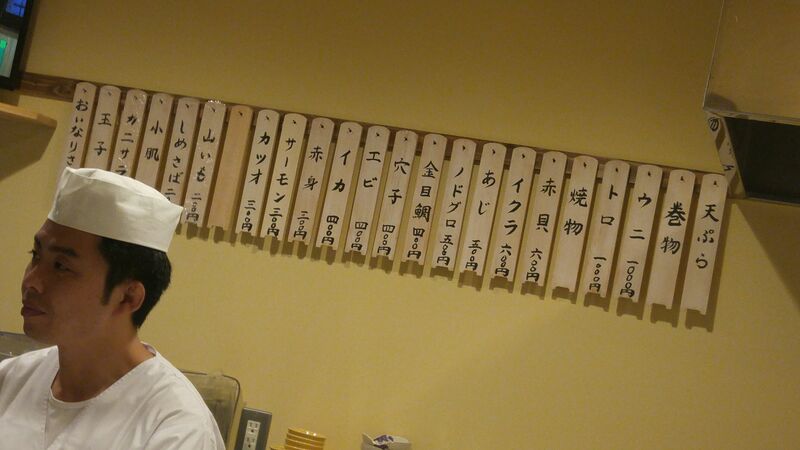 Moreover, it serves a splendid array of local products seasoned with locally-grown fresh wasabi! 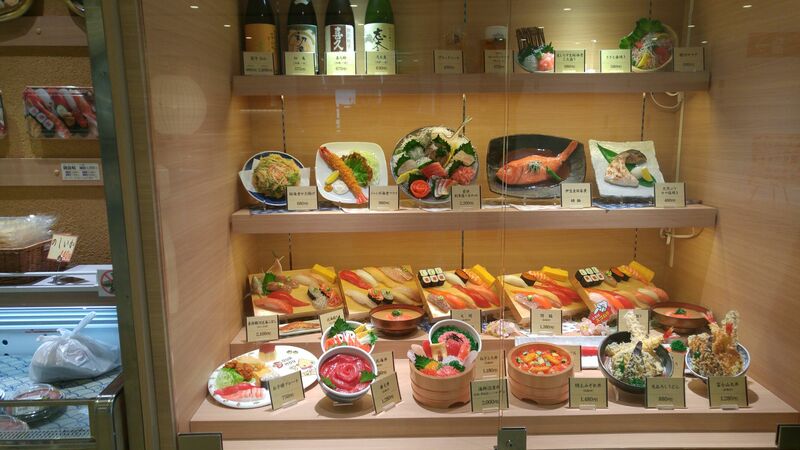 As we had come just at the opening time I had the chance to take pictures of the morsels in their glass displays without interfering with any customer! 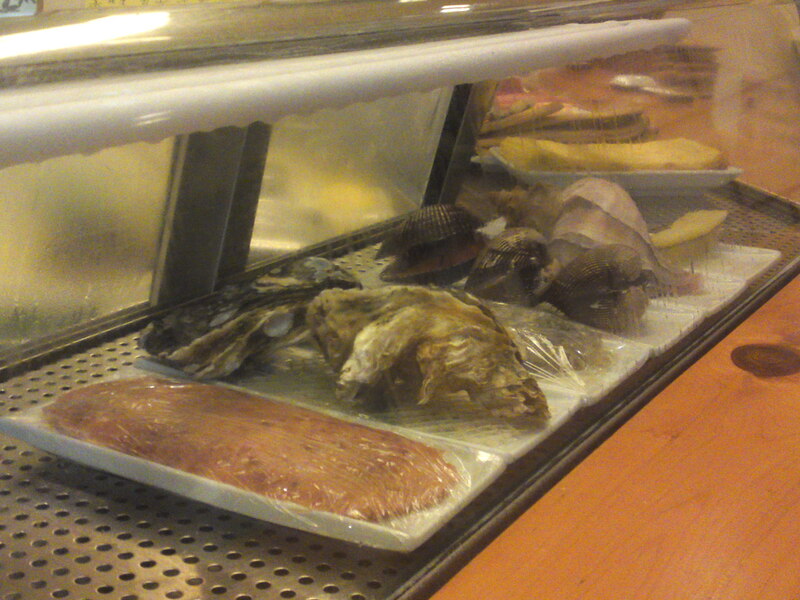 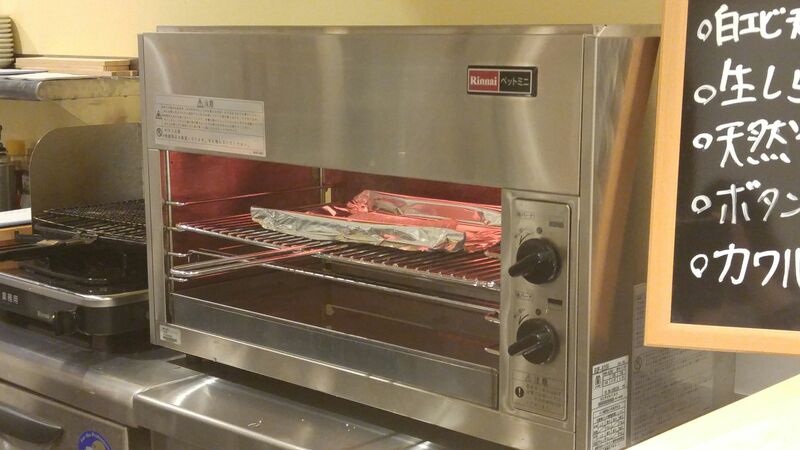 You will be able to see these if you sit at the counter! 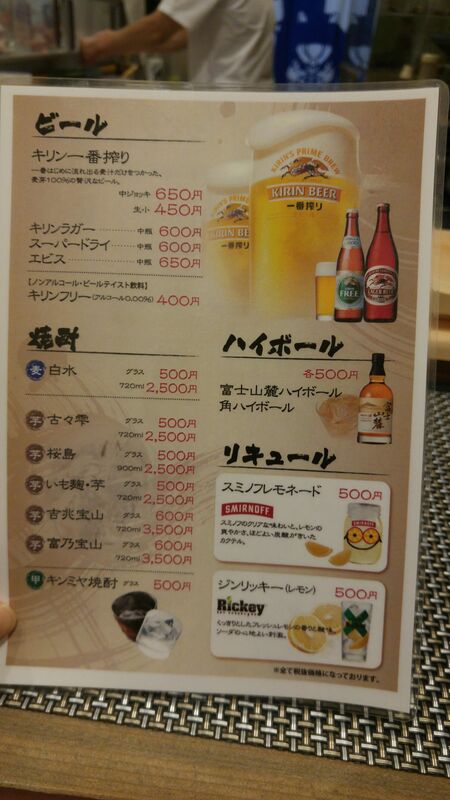 Bear in mind that sitting at the counter costs more is just a fallacy! 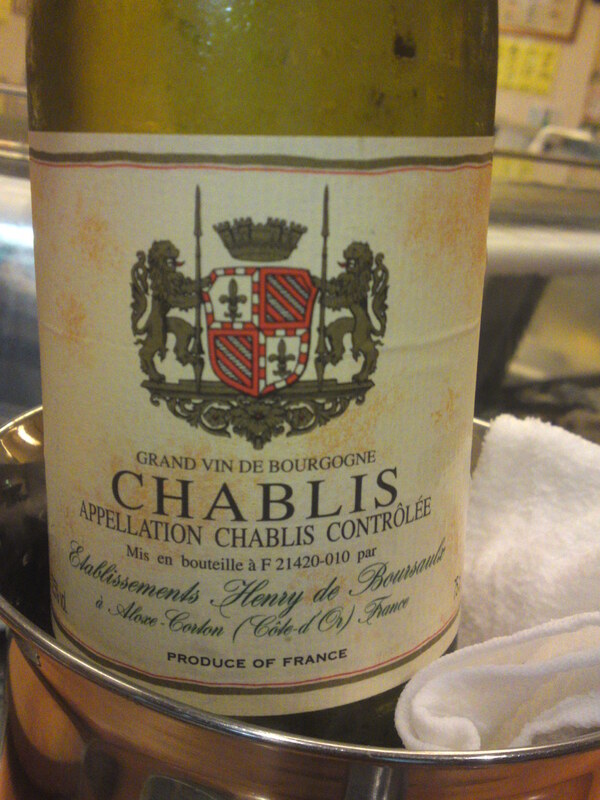 For once we drank white wine and French Chablis is just perfect for sushi! 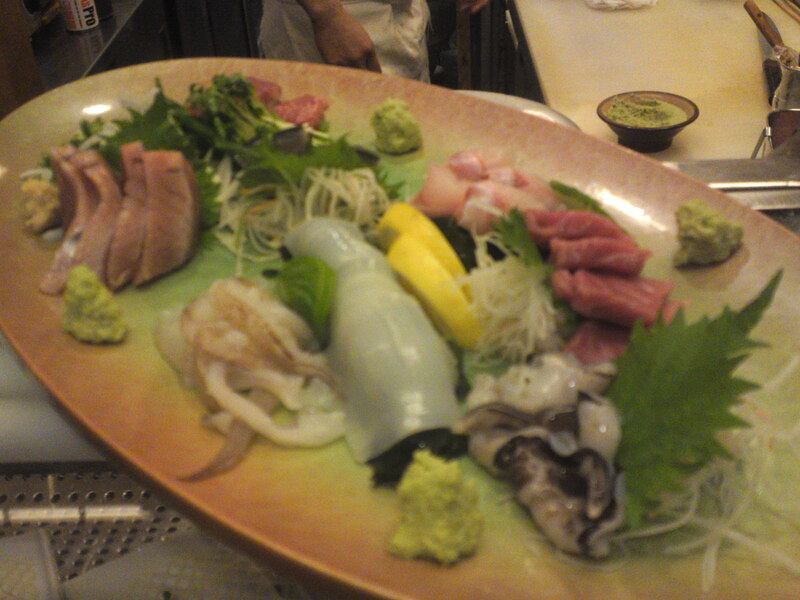 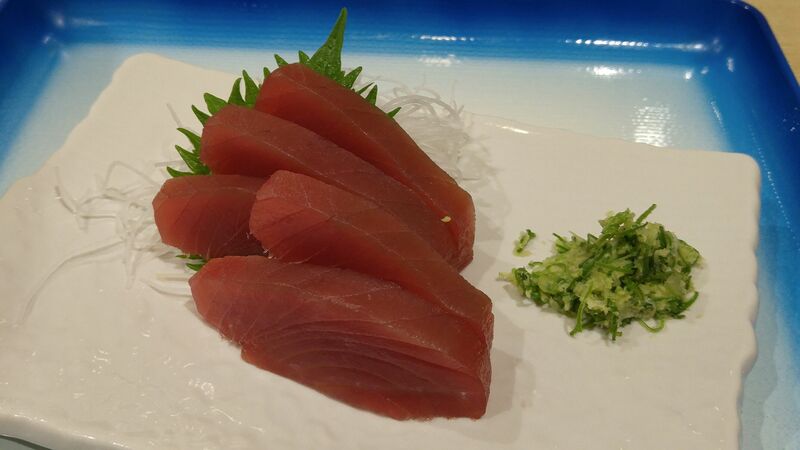 We alwaays start with one of the sashimi plates of the day. 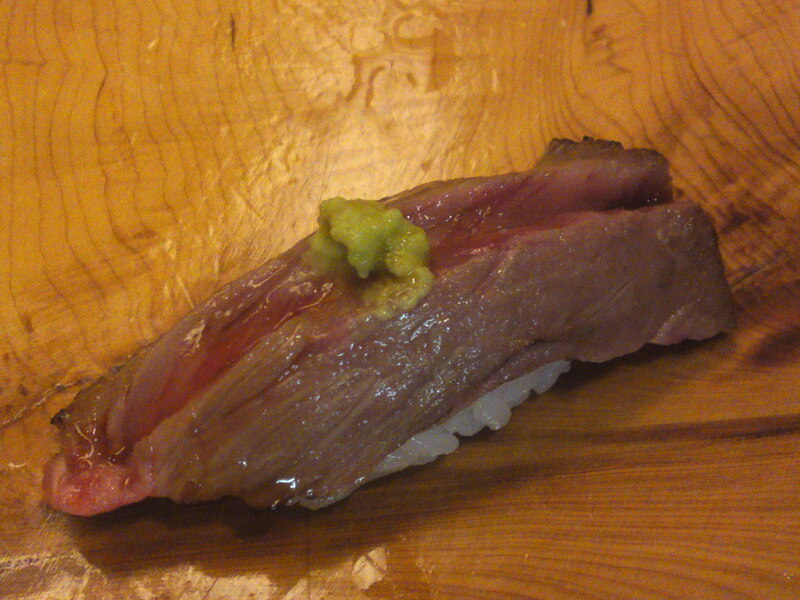 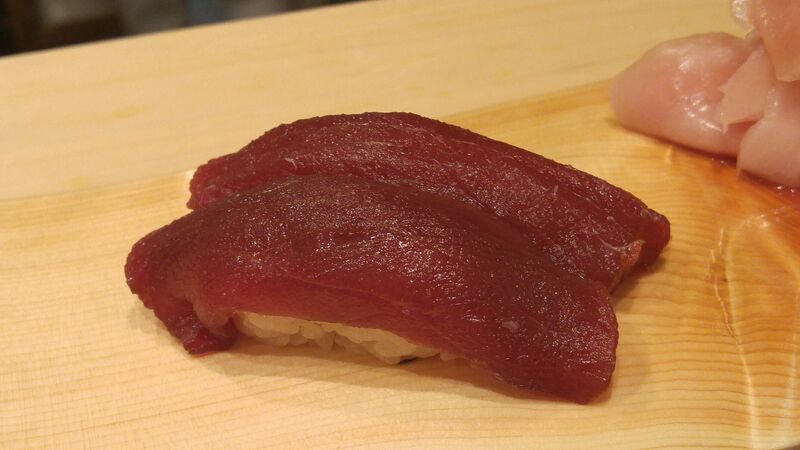 In this case, Bonito/Katsuo/鰹! 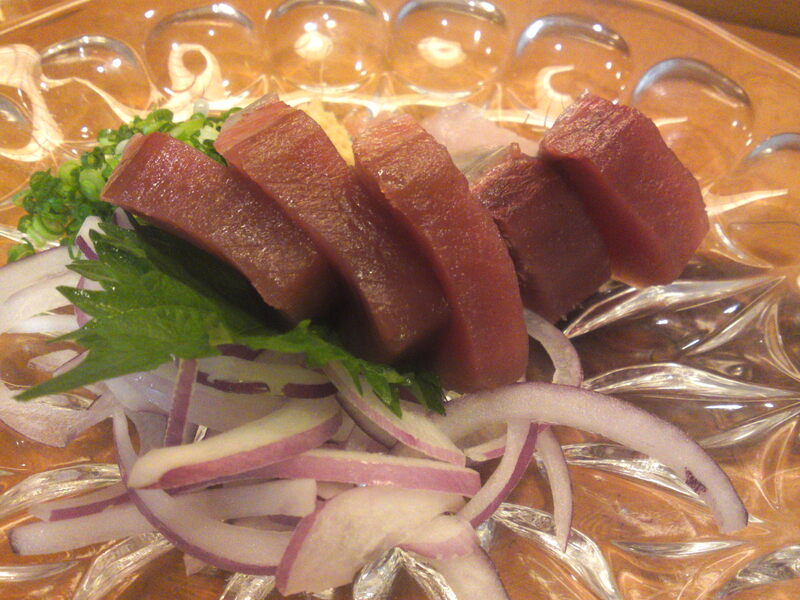 Always served on a bed of red onion! 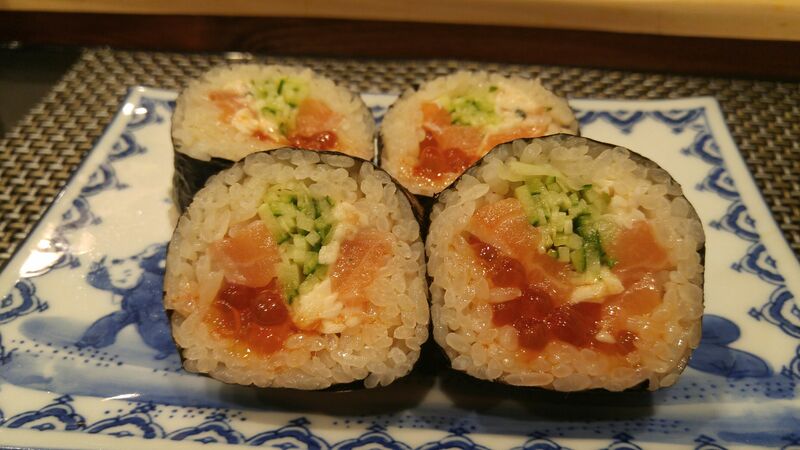 With plenty of chopped scallions and grated fresh ginger! 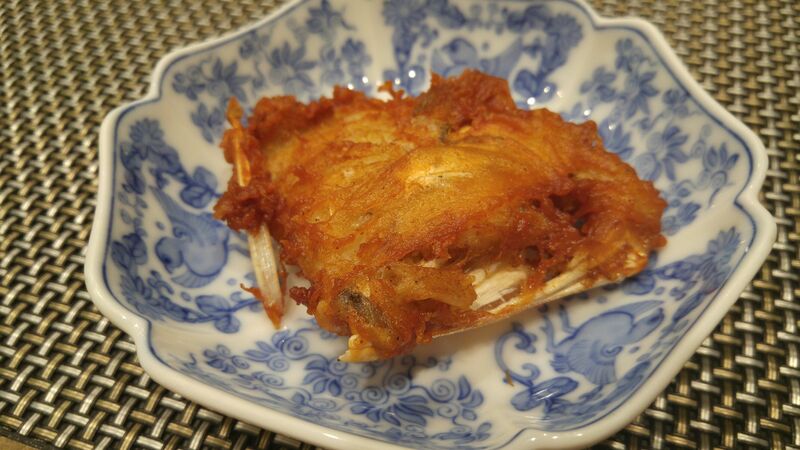 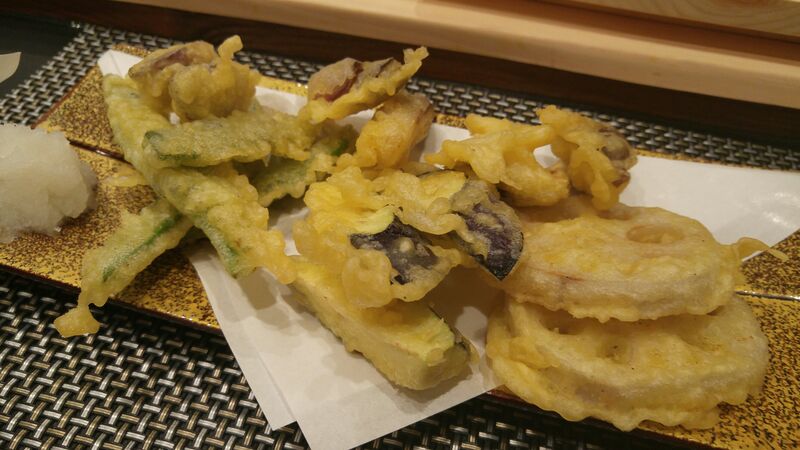 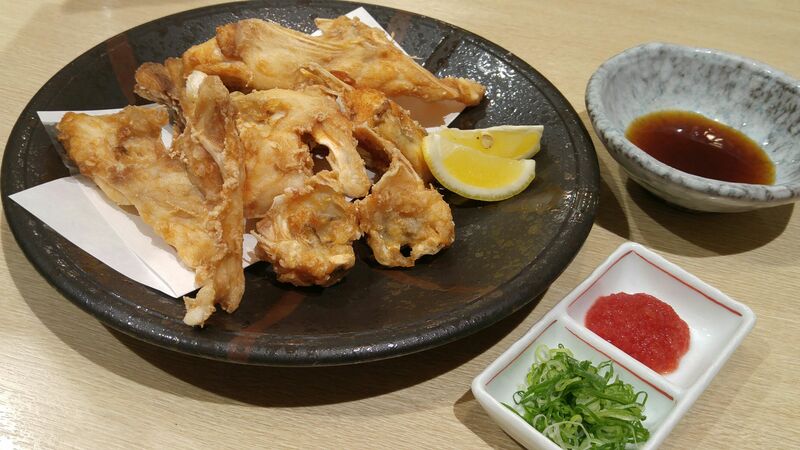 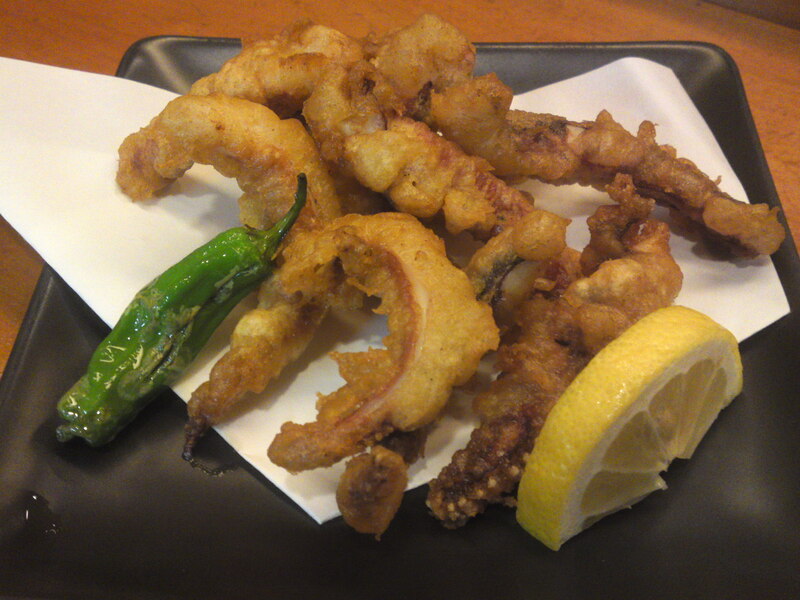 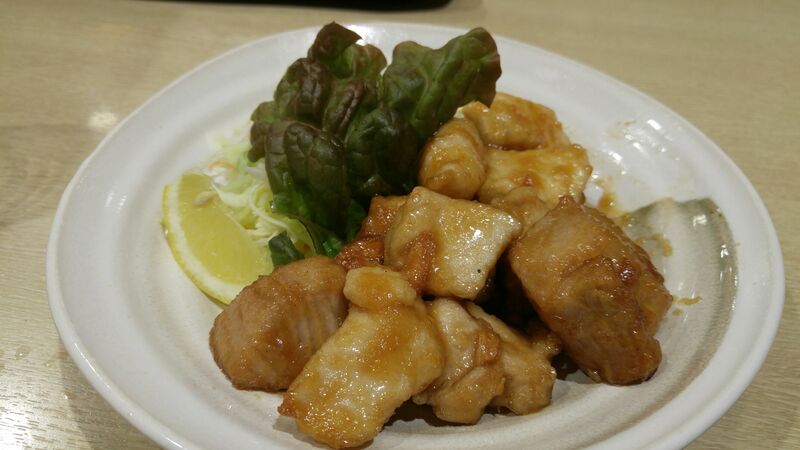 For people who don’t fancy raw squid, ask for their tentacles deep-fried,ika geso karaage/烏賊ゲソ唐揚げ! 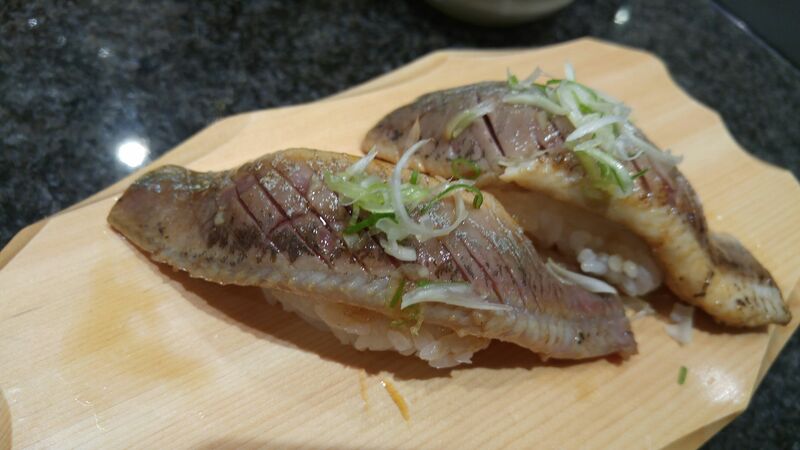 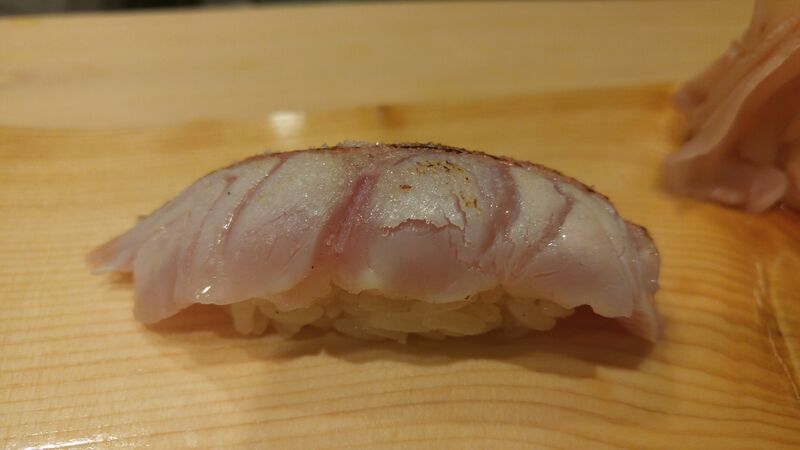 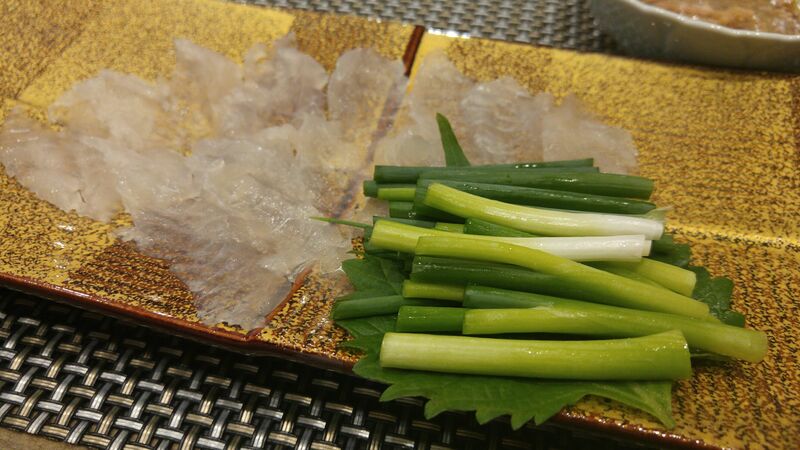 A rare fish from the Suruga Bay: Rosy seabass/nodoguro/ノドグロ! 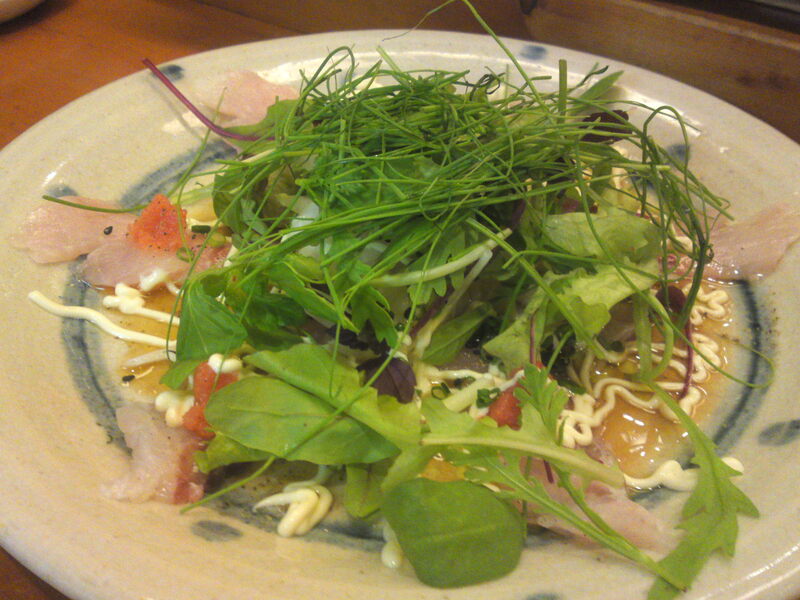 Served as carpaccio with plenty of greens! 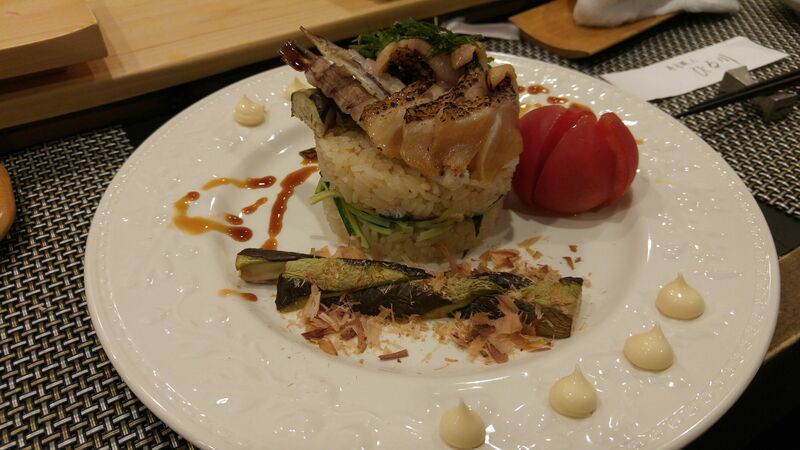 The chef confided that it was the first time he served it as such a request! 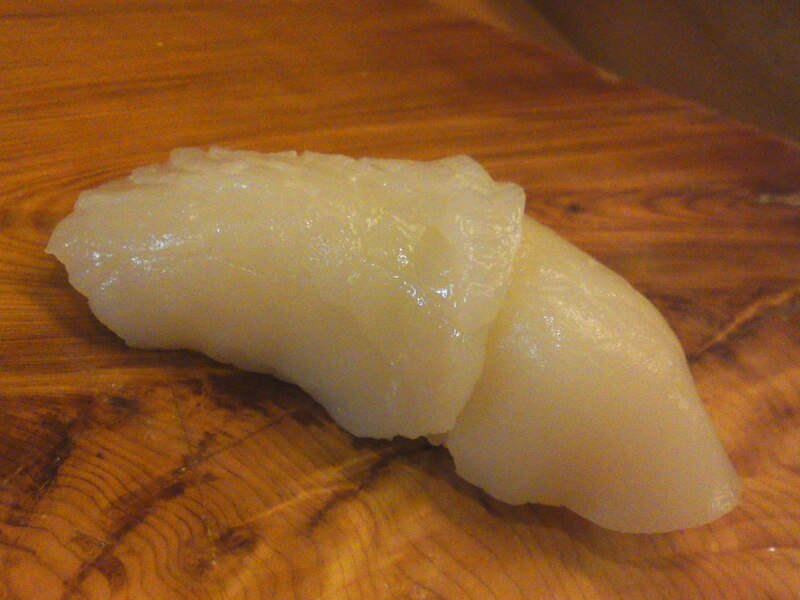 Then it was time for a few nigiri-styles sushi: scallops/hotate/帆立! 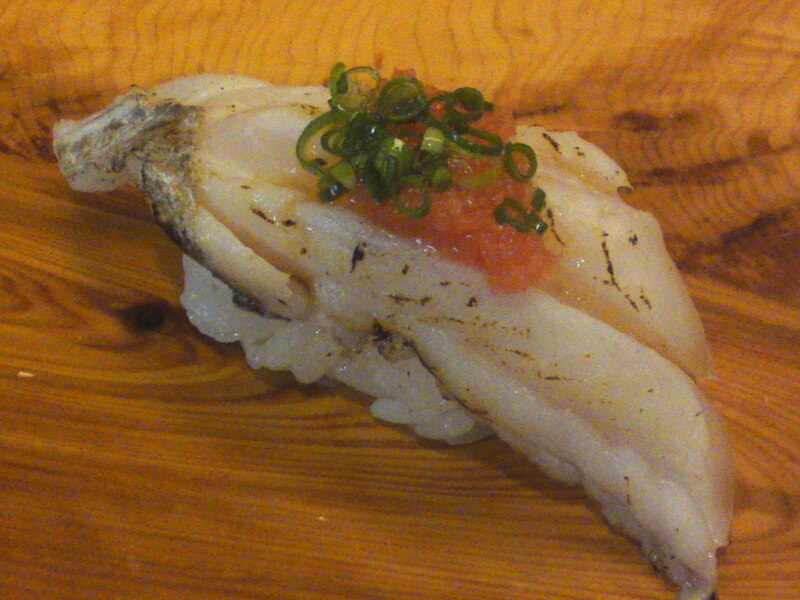 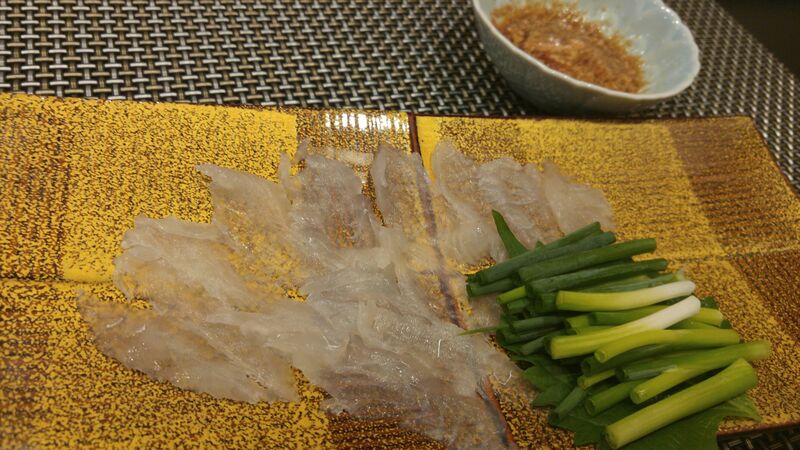 Seared scabbard/cutlass fish with ponzu and momiji oroshi/Tachiuo aburi/太刀魚炙り! 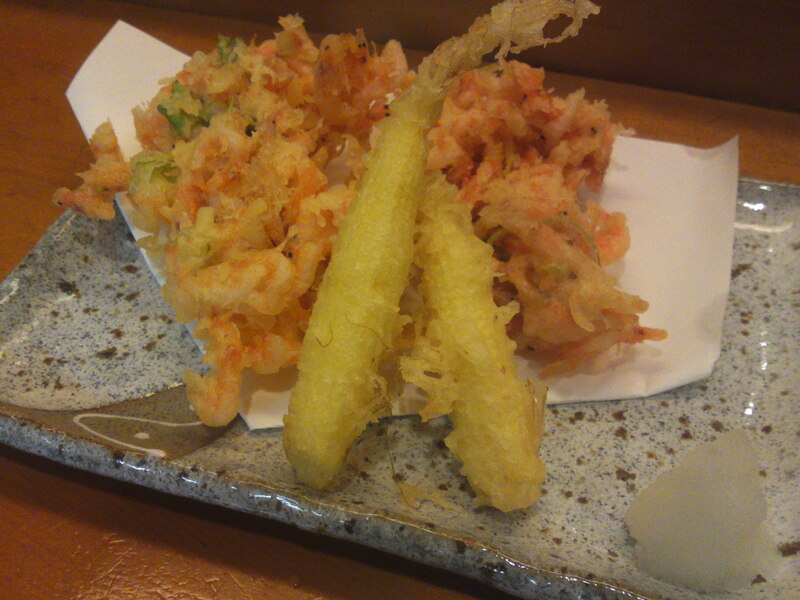 back to a cooked morsel typical of Shizuoka Prefecture: Deep-fried Cherry shrimps and baby corn/sakura ebi kakiage to young corn/桜海老かき揚げとヤングコーン! 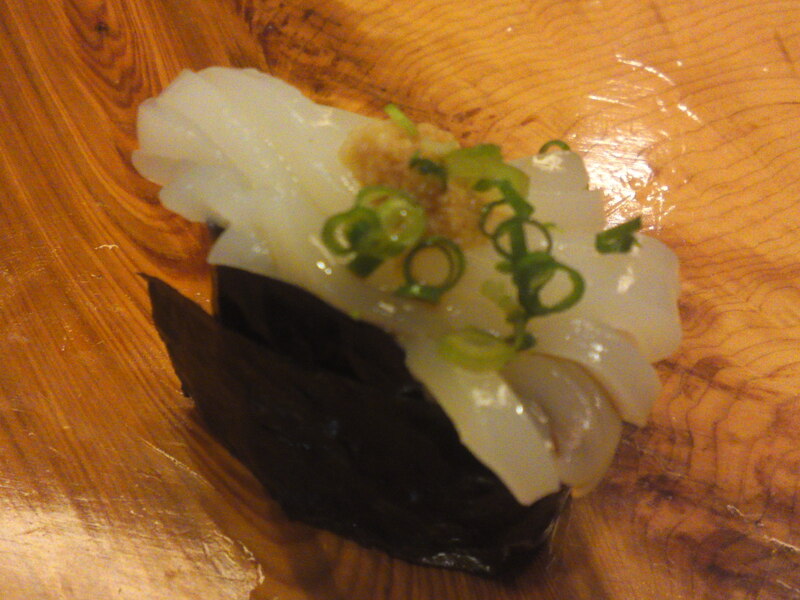 Squid “noodles” in gunkan/mothership-style sushi/Ika soumen gunkan nigiri/烏賊素麺軍艦握り! 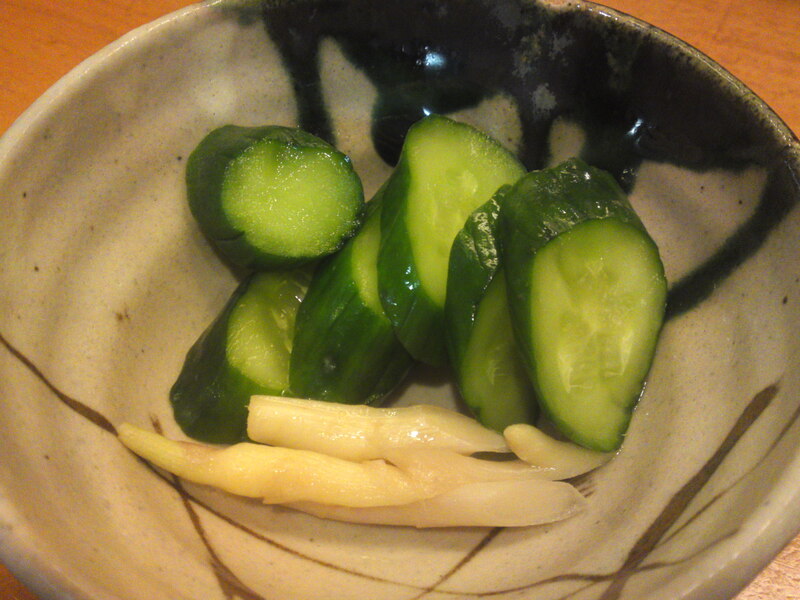 Some-homed mad pickles to accompany the next drink! 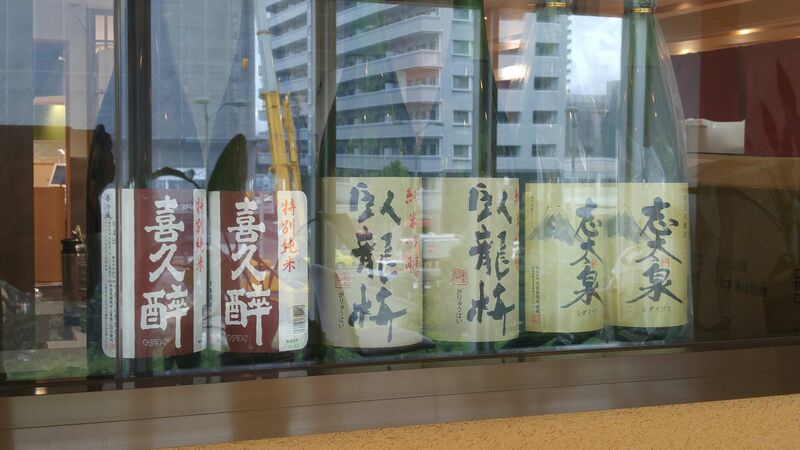 Junmai ginjo by Fujinishiki Brewery in Fujinomiya City! 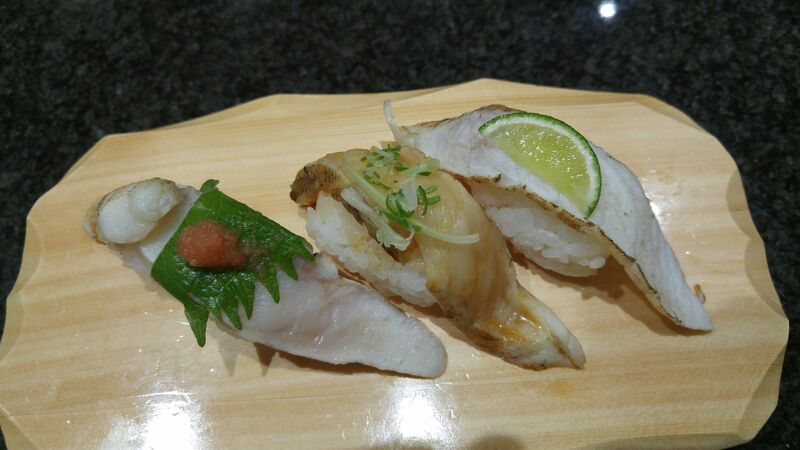 Spicy scallops roll/piri kara hotate maki/ピリ辛帆立巻! 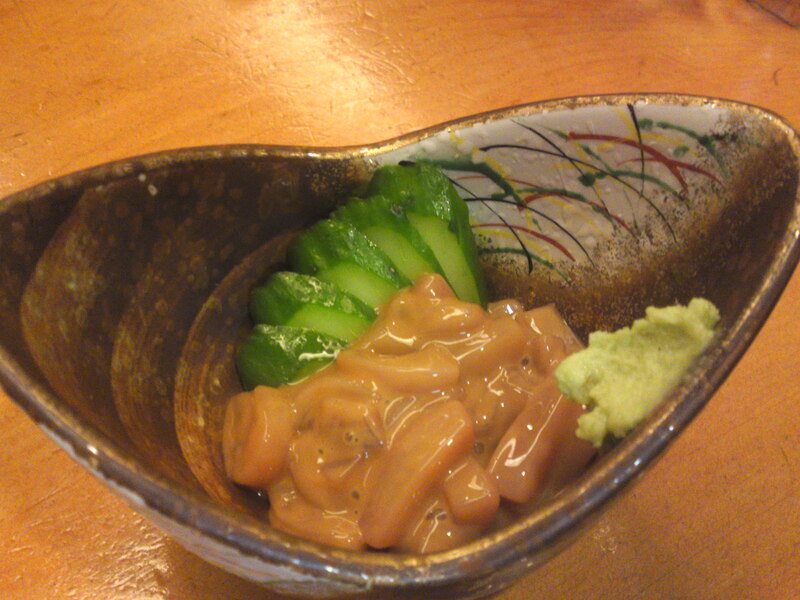 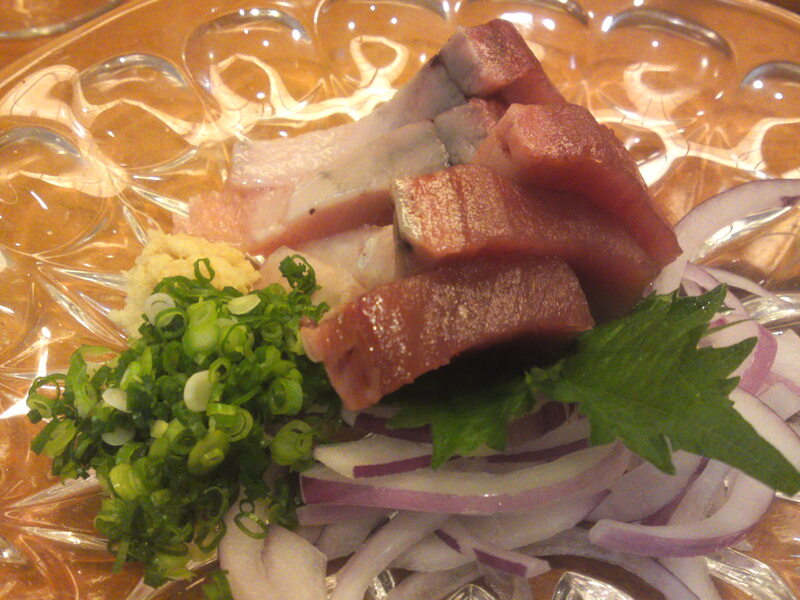 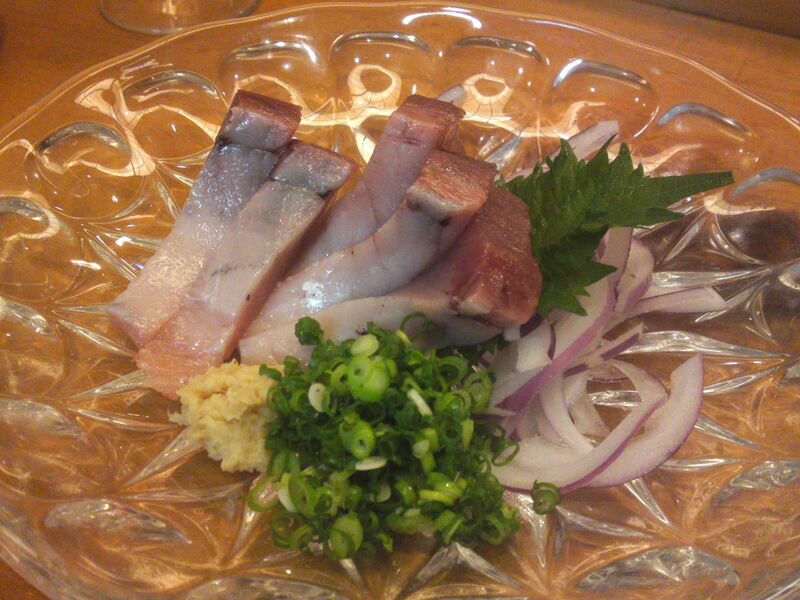 Pickled squid for the Dragon!/ika shiokara/烏賊塩辛! 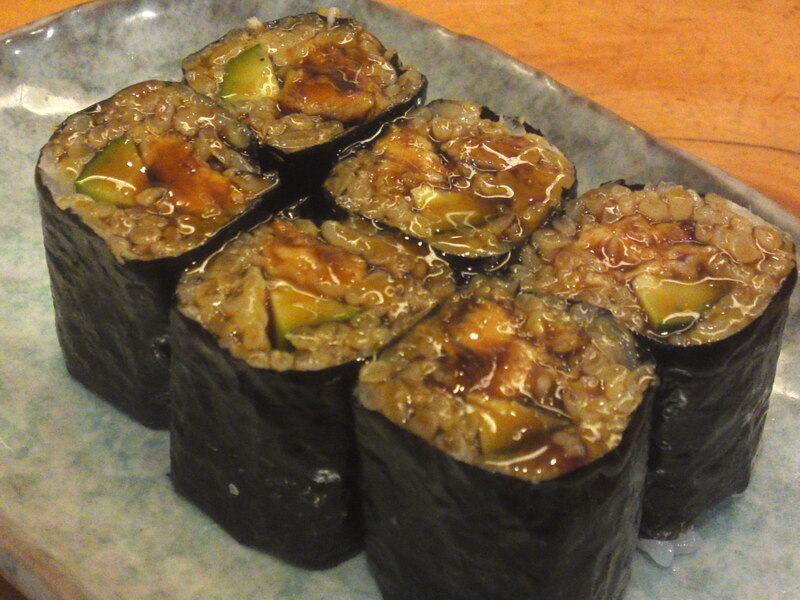 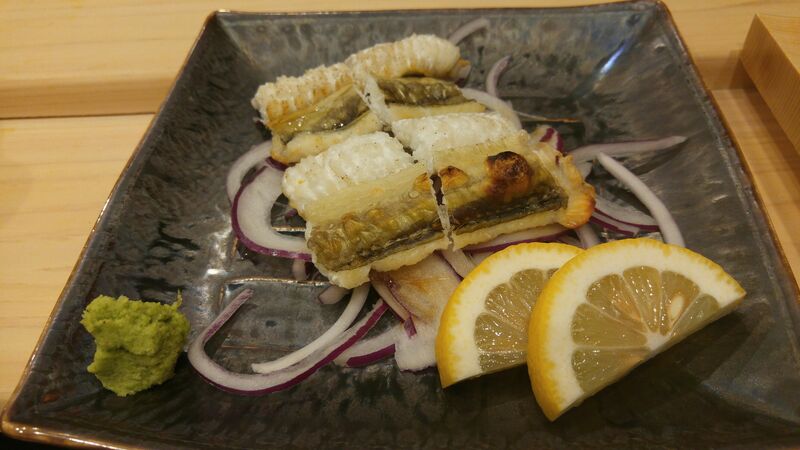 Conger eel and cucumber roll/Anakyu Makiアナキュウ巻! 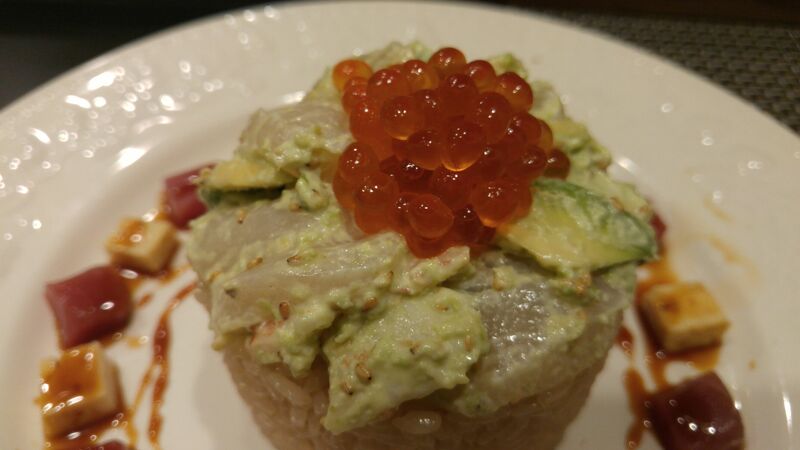 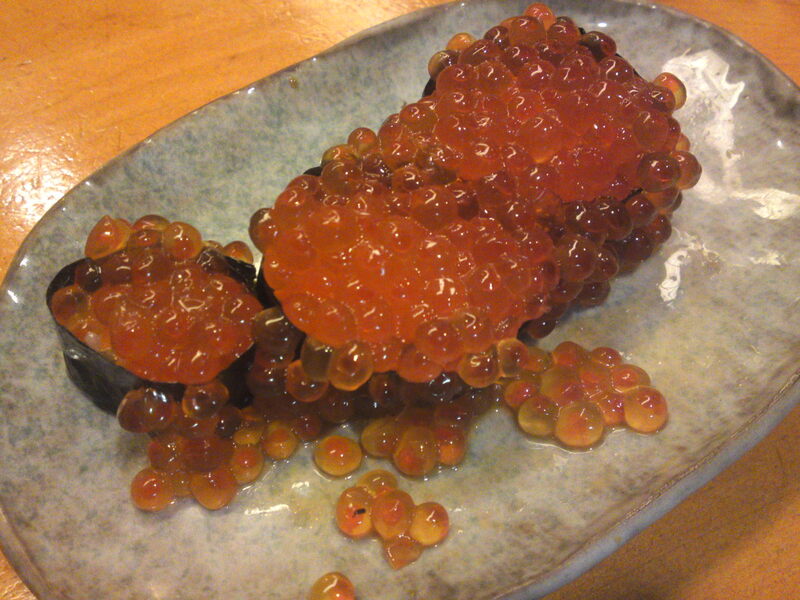 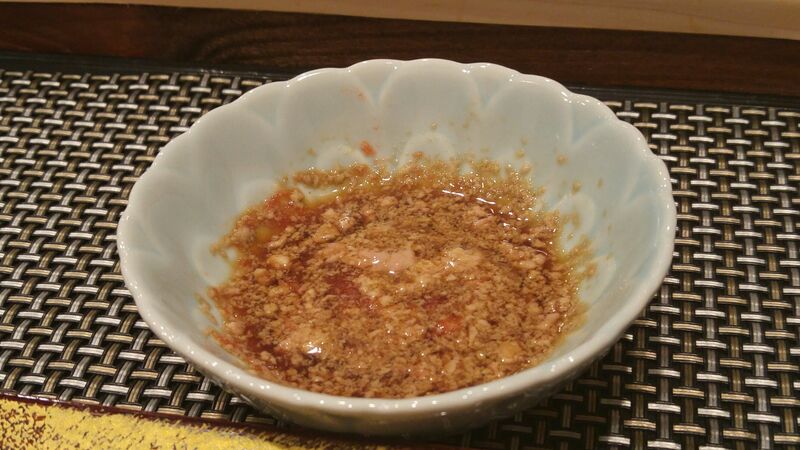 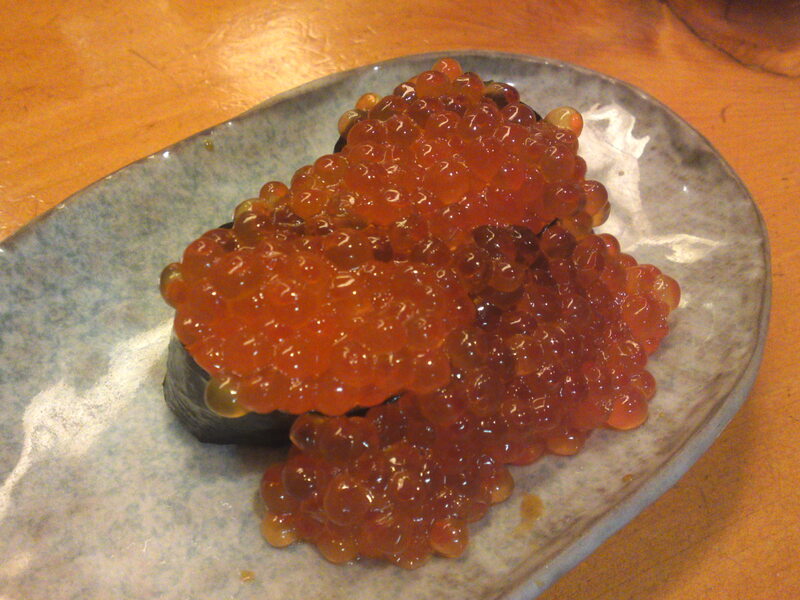 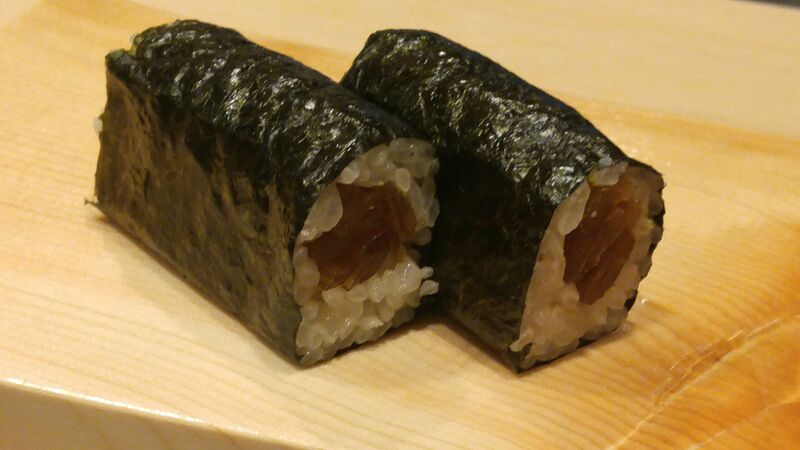 Salmon roe in gunkan sushi style/Ikura gunkan /イクラ軍艦! 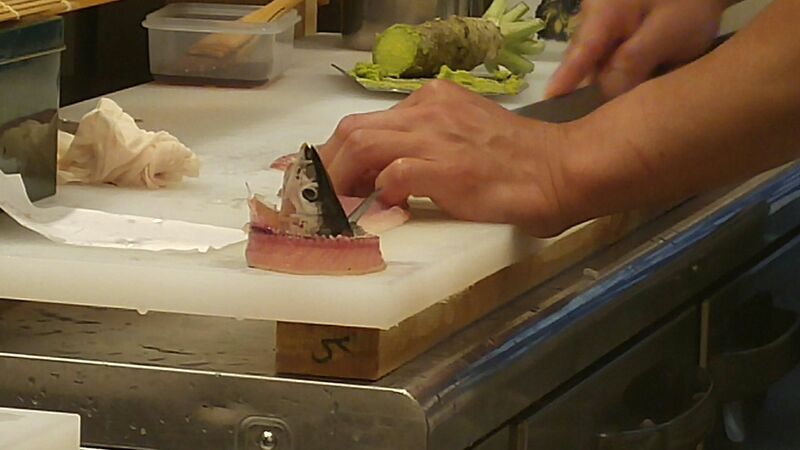 Having some fun with it! 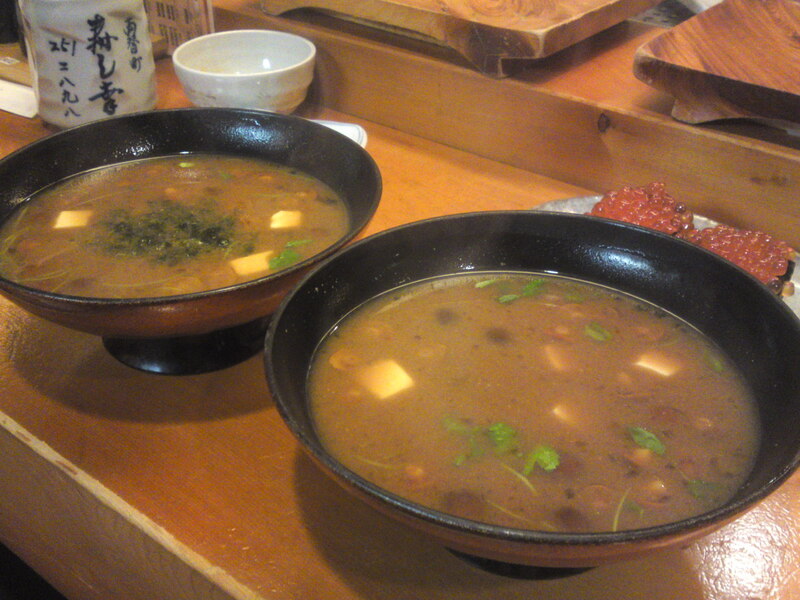 And nameko mushroom soup to finish!